Hong Kong is one of the biggest world harbours. As such, it is one of the huge transiting places for container ships. On the way, these ships need to refuel. It was thus that I had the opportunity of sharing the life of the crew of a refueling ship for a few hours, during one of their shifts. 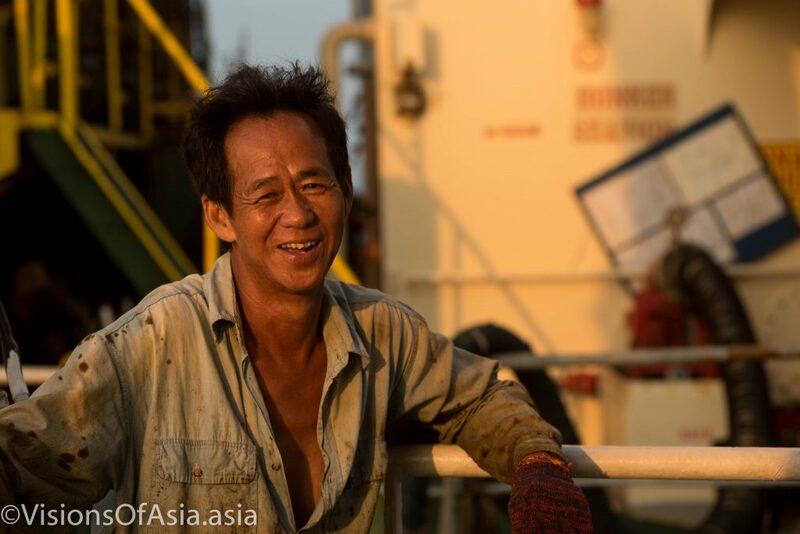 The life of this ship is shared between refuelling the ships which transit through Hong Kong and taking in oil to fill its tanks. There are two crews of 5 people who share the grueling 12-hrs shifts. 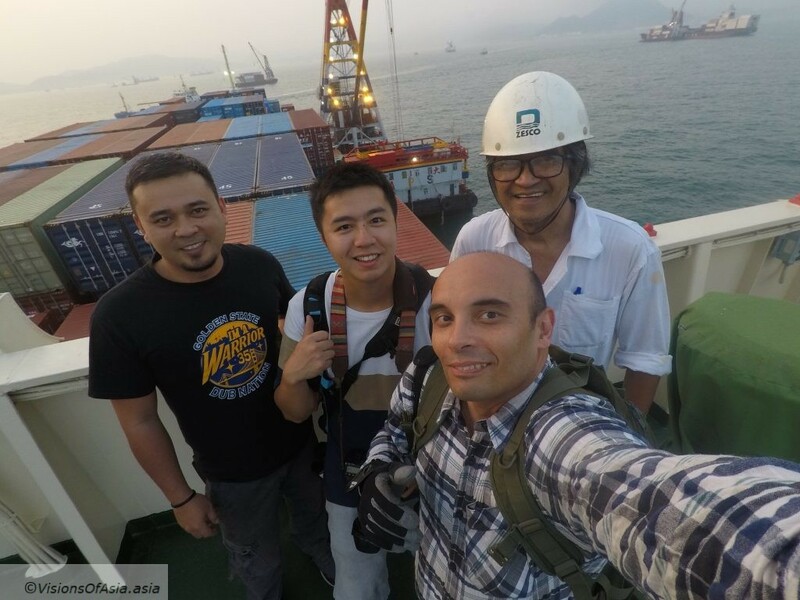 As we got closer to the container ship we had to refuel, the crew took its positions. Crew in position as the refueling ship nears its client. 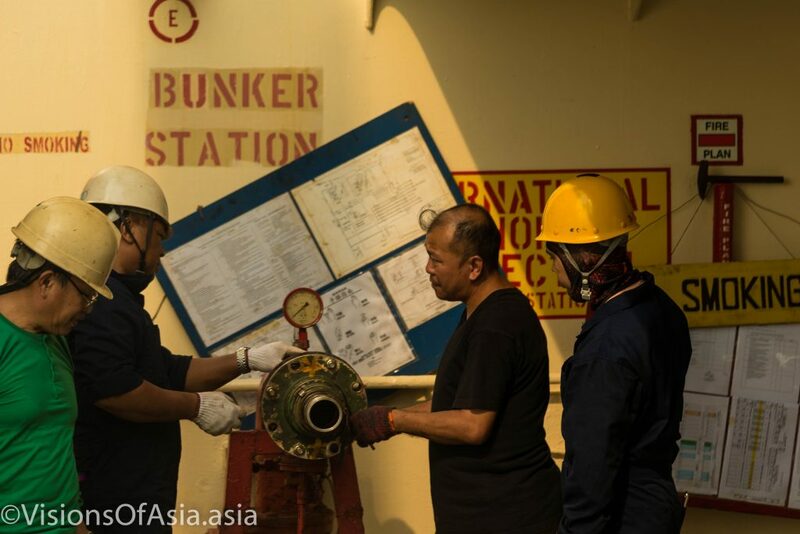 While interspersed with long periods of inaction, the work aboard the refueling ship can also take its toll, because of the long periods of work. The crew ensures continuous shifts between filling its tanks and refueling, which go up to several hours, with just two or three hours to rest. 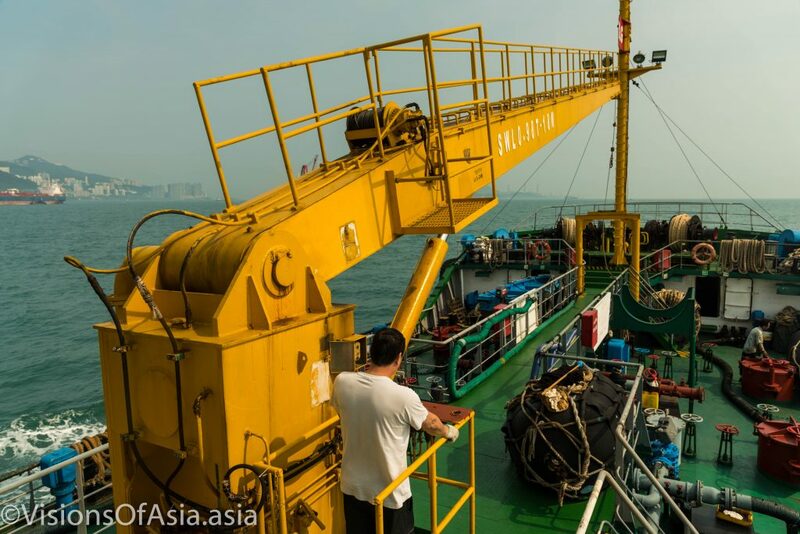 As we were nearing the container ship, the workers started hoisting the heavy buoy to separate both ships. 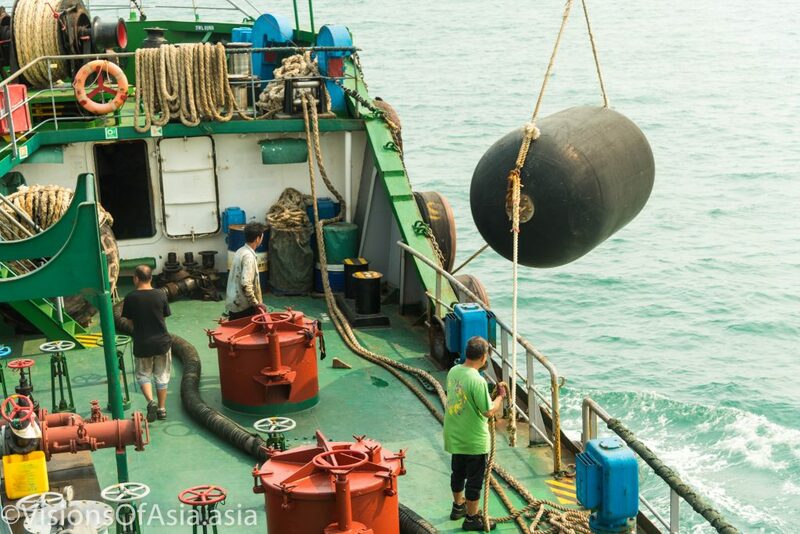 The crew prepares a buoy to isolate from the ship they are about to refuel. Despite their hard work, all the men of the crew were extremely welcoming for the photographers and very helpful in guiding us. This day, we were to fuel a Japanese container ship, the “Hyundai Harmony“, with Panama flag. Initially, this all started with having to moor both ships together, to avoid any issue during the delicate refueling operations. 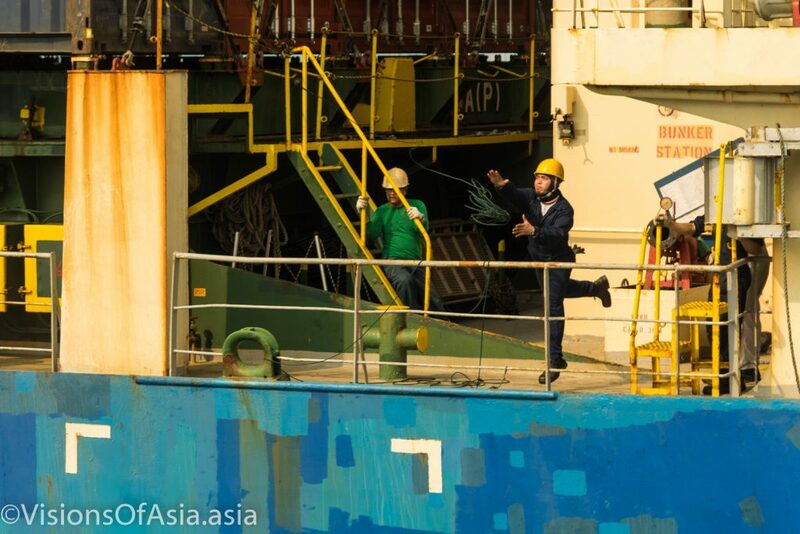 A crewman of the “Hyundai Harmony” throws a loaded rope to the refueling ship. This also involved crews of both ships throwing loaded ropes to reach the other ship and pull the heavier ropes. 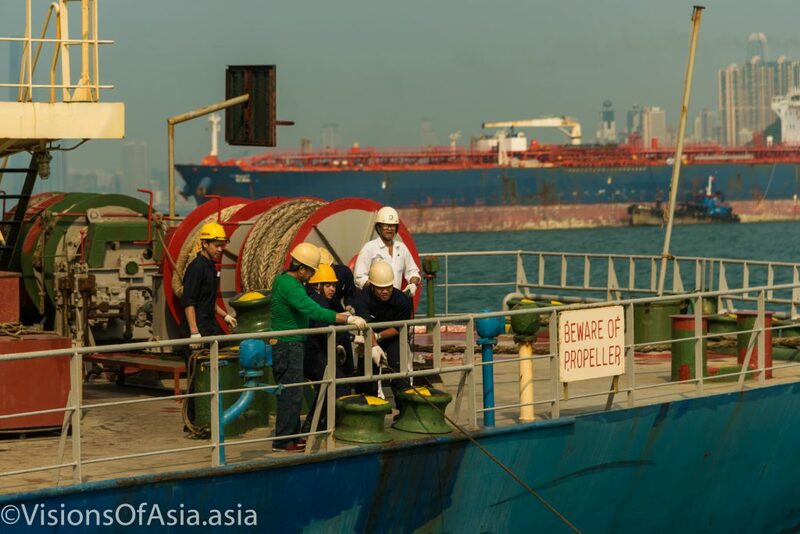 The crew of the Hyundai Harmony then started pulling the ropes to secure both vessels together. 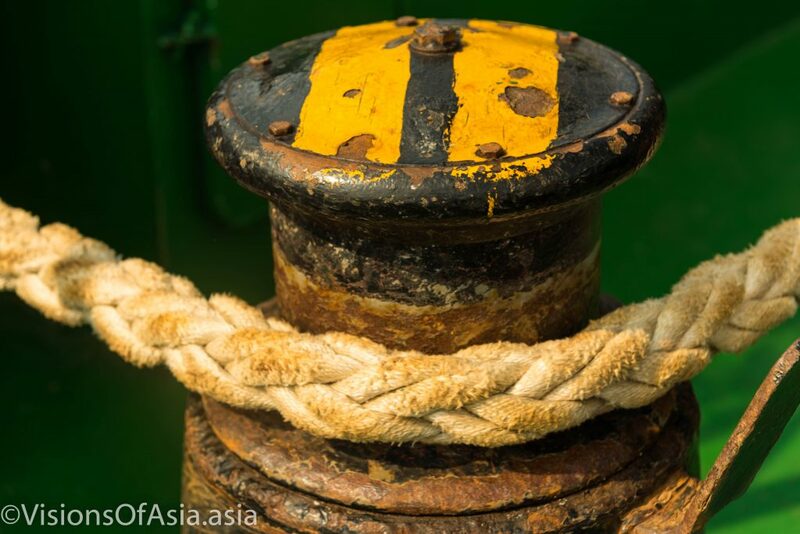 On the refuelling ship, Two heavy motors started pulling a very old and fraught rope and brought the two vessels together. 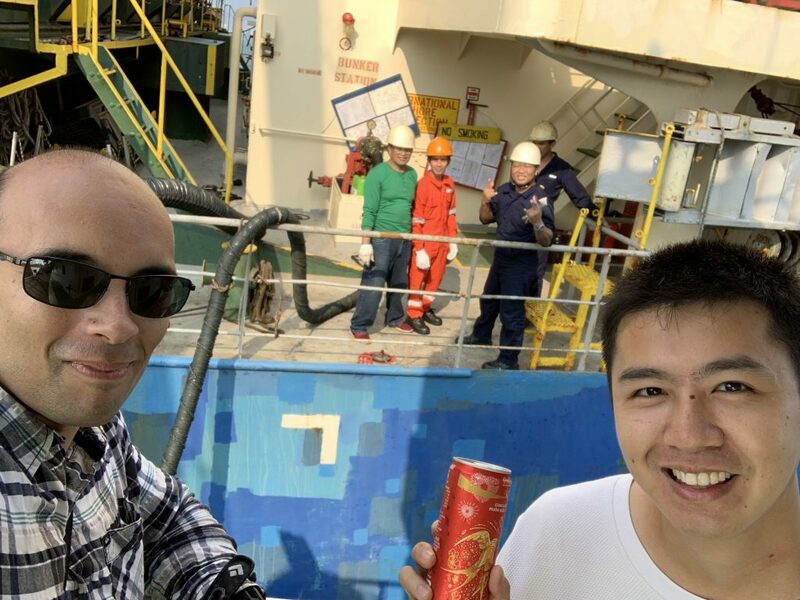 After mooring alongside the ship, several of the crew members of the refuelling ship boarded the “Hyundai Harmony” to help them to connect the hoses for fuel resupply. 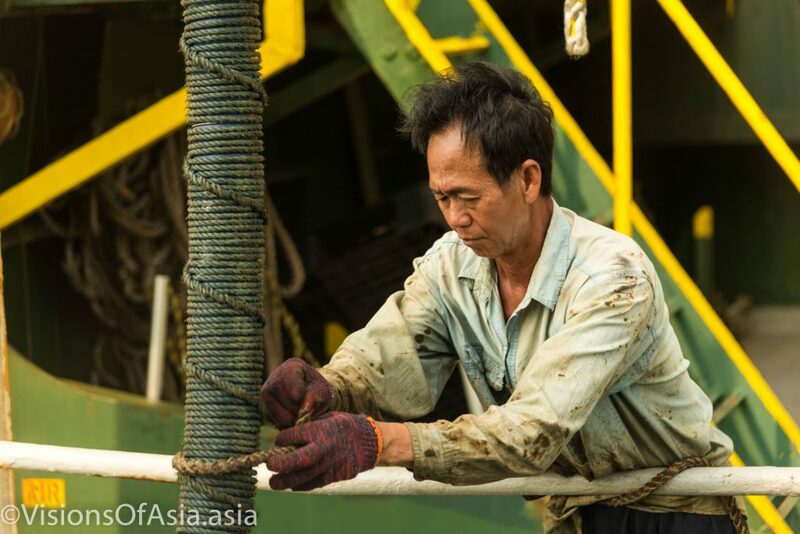 A crew member prepares the hose for connection onboard the container ship. This also gave way to some exchanges near to the connection pipes. Interestingly, the Hyundai Harmony was using maritime diesel for propulsion in China, and heavy fuel for propulsion out of China. It also tells how regulating maritime energy consumption might help to solve the pollution problems which keep affecting our planet. 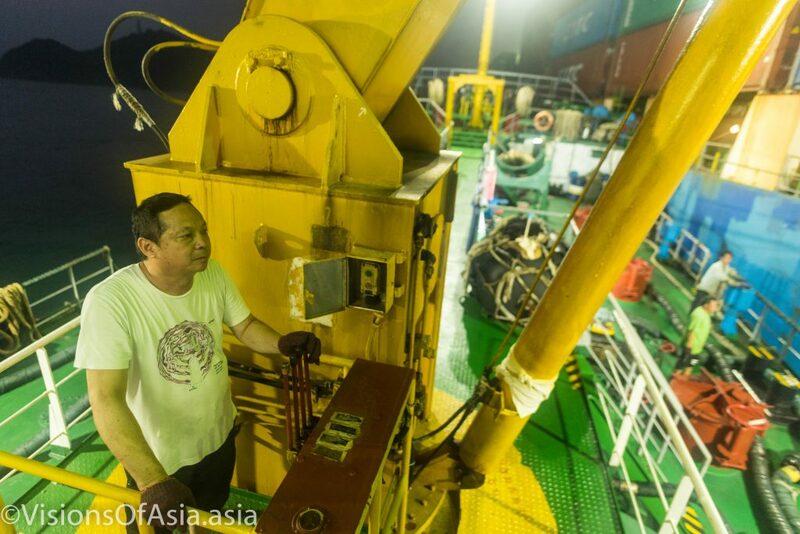 The Chinese and Filipino crew of both vessels exchange around one of the diesel entry vents. 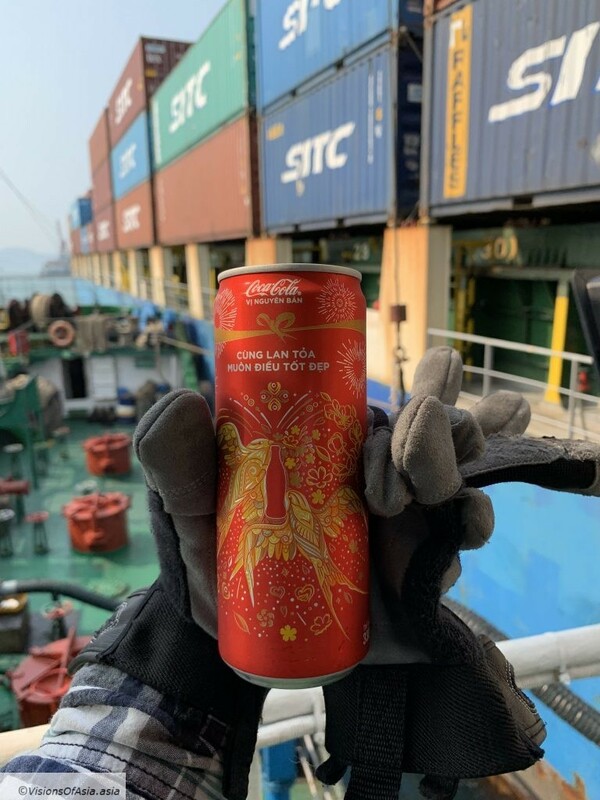 A close view of the Vietnamese coke can we were given. The beautiful part of that trip was that the welcoming nature of seamen. 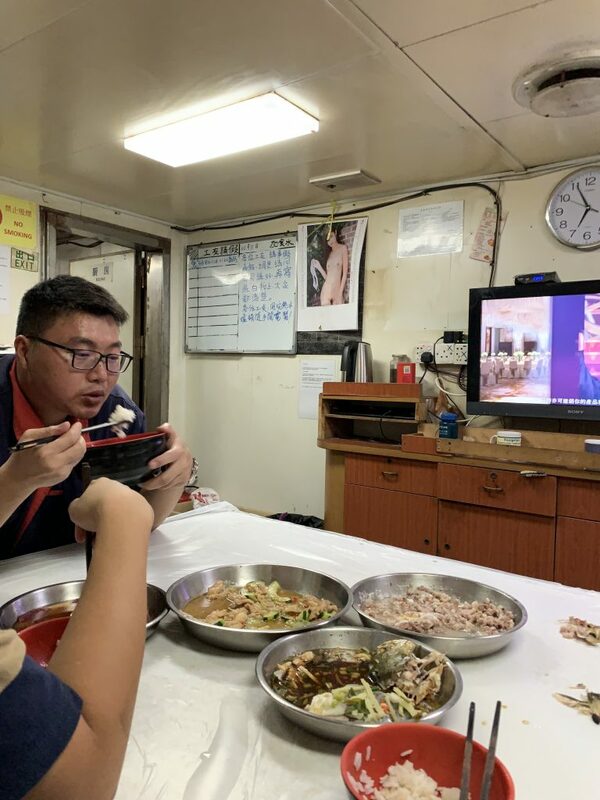 We were quickly integrated in the group and were even invited to share the dinner of the crew of the refueling ship. The ship’s mess was really a men’s room, complete with pinup on the wall. To give an idea of the ship, I did film a walkthrough, starting with the first mate’s quarters. Walking through a refuelling ship. Despite their hard work, the crew also knew to smile, and this allowed me to get this lovely portrait of a member of the crew. 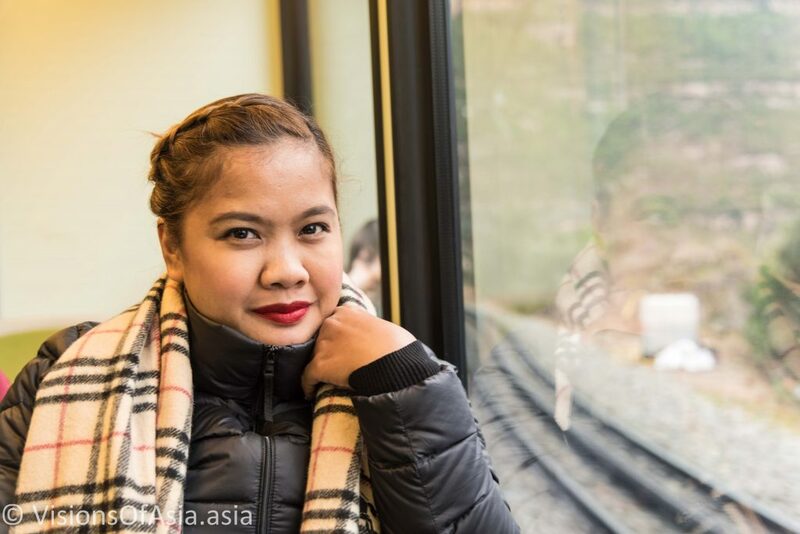 The moments of happiness were also present among the Filipino crew who joked playfully among them. 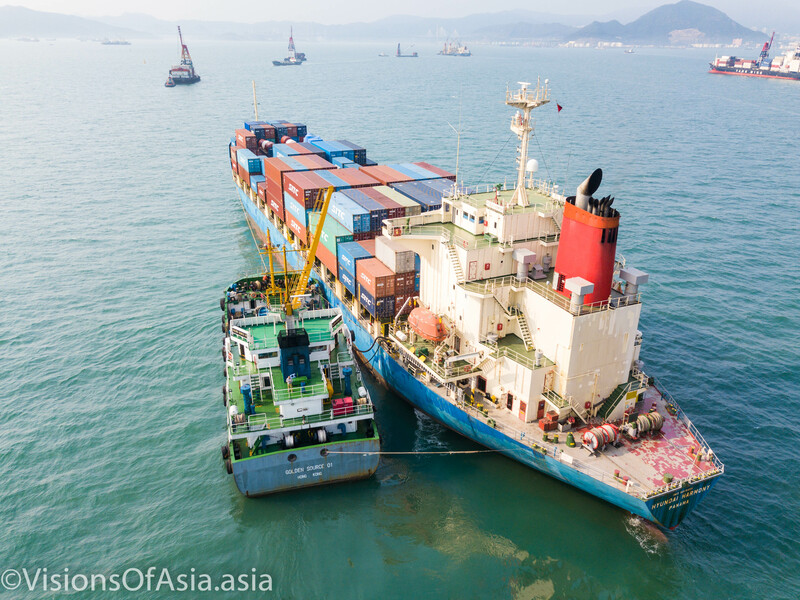 Soon, and after some hesitation, as there was no proper gangway to reach the other ship, we decided to head to the container ship and see closer our new friends. Both crews jumped very easily from one ship to another, the frequency of the maneuver probably inoculating them to the inherent danger, but for my friend and me, it was the first attempt. We however benefited from the friendly advice of one of the crew members who gave us some tips on how to cross the most safely possible. As the sea was calm and the ships were quite close, the danger was limited, except for the grease present everywhere on this fuel ship, which made metallic surfaces quite slippery. In the end, we managed to set foot on the other side. 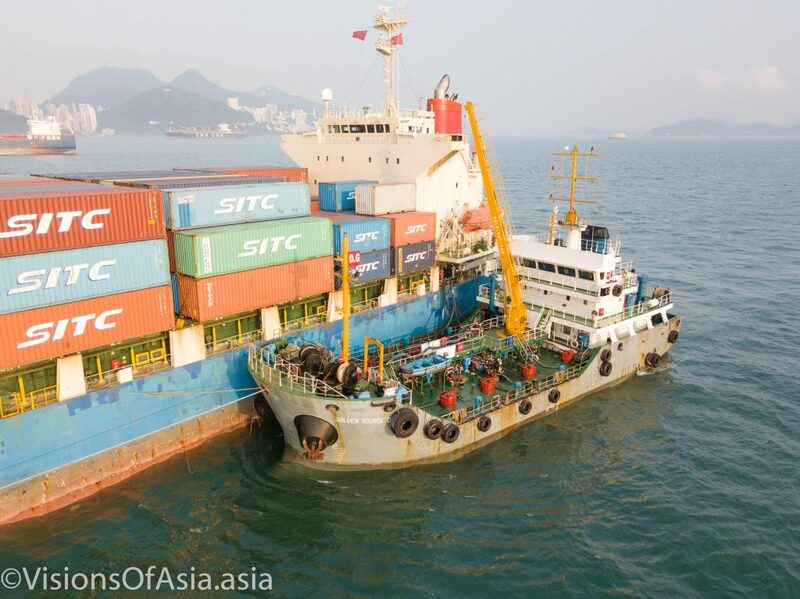 On our request, the crew accepted to accompany up topsails, to the bridge of the Hyundai Harmony. We took a selfie at the top. Drone views of the refueling: taking off from a ship, a challenge for the compass! This refueling operation was an occasion for me of testing takeoff and landing on a reduced space, namely a ship. For a drone pilot, taking off from a ship spells great trouble, as everything is metallic… So the compass becomes just crazy. The key is to master the “hand launch” (which can be pretty easy, if you go through the route of the automated launch). The key here, being to use the on-screen “launch instruction” rather than the remote control. Indeed, when using the on-screen launch program, the drone automatically rises to 1 m 20 above its launch point (your hand). This minimizes risks of getting hit by the propellers, but you should clearly raise your hand well above your head. While I took also a number of shots in horizontal perspective, I believe the portrait mode of the Mavic Pro allowed to get the best impression of the length of the container ship. Other shots shop the refuelling ship in operation next to the container ship. Refuelling operations on the Hyundai Harmony. After the refuellng was completed, the tanker ship unmoored and started heading to refill its tanks with more fuel for the next shipment. 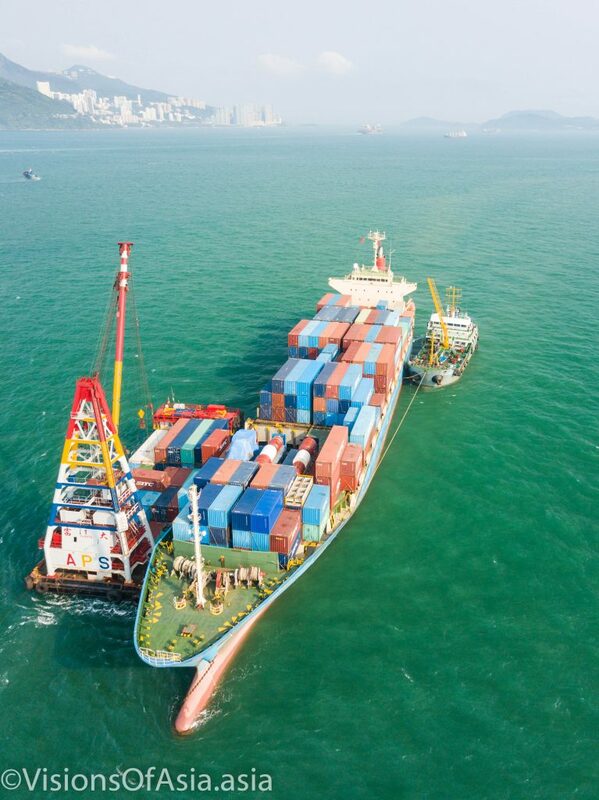 One the pipes were back on board, it was time to bring back up the heavy buoy that avoided our ship creating friction with the container ship. The interesting part was that they did this while on the move. I decided to use a tripod and long exposure to show the movement, while keeping the ship in focus. 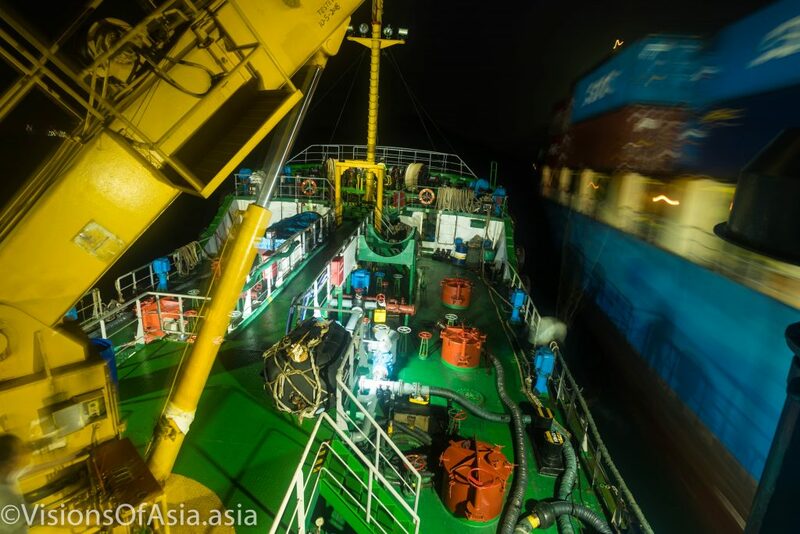 We could have remained with the crew until 3 AM, the time at which the ship’s tanks would be filled again. 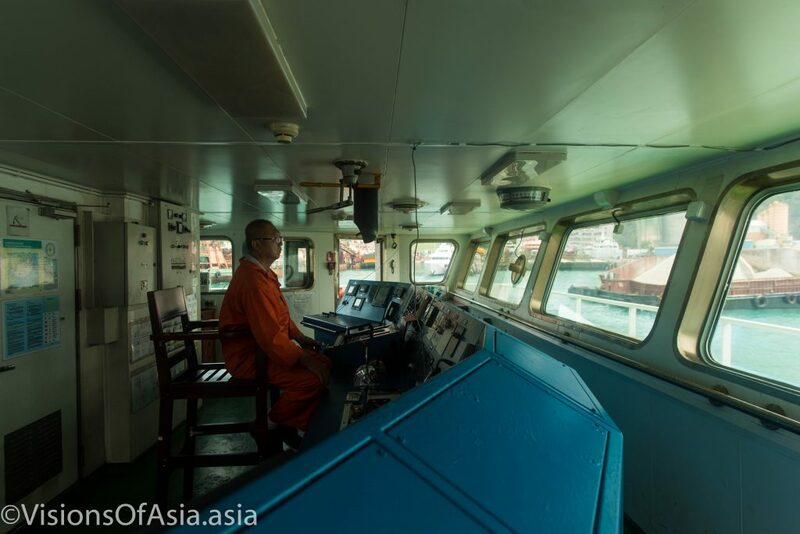 However, anxious of getting some rest, we opted instead to hitch a ride on a fast boat which was carrying one of the HK technicians sent to assist the Hyundai Harmony. But this was not before taking a last parting shot of the ship. On a nice Sunday, my friend Matthew and me, both decided to go for a hike around , but an exploratory hike, without knowing too much where we were headed. 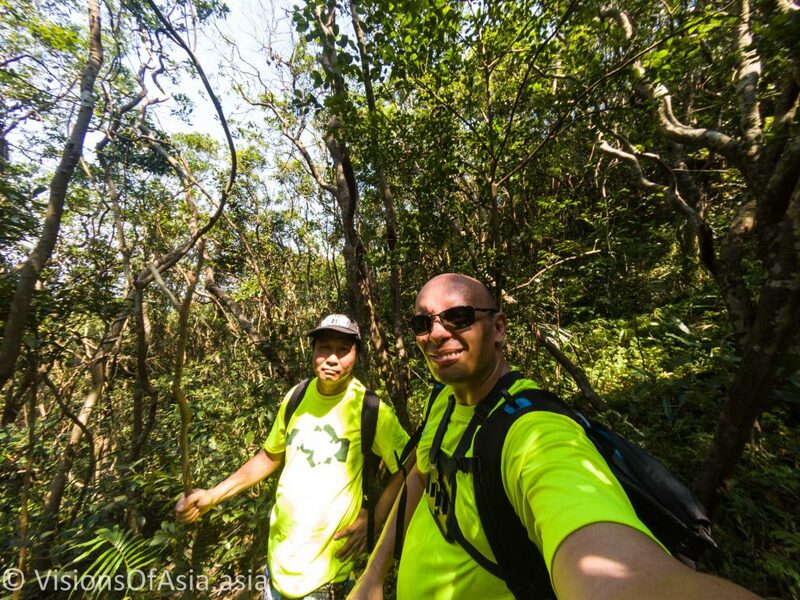 In the end, it took us across some less traveled trails all the way down to the Maclehose trail. 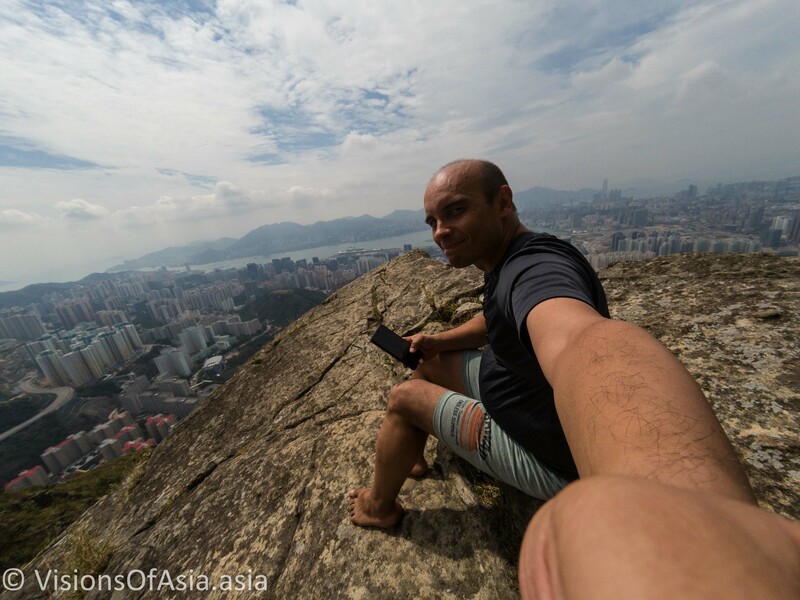 Of course, although I live near to Kowloon Peak, this still means I must climb about 300 m to get to the Kowloon Peak viewpoint. As usual with any hike lately, I did it barefoot. 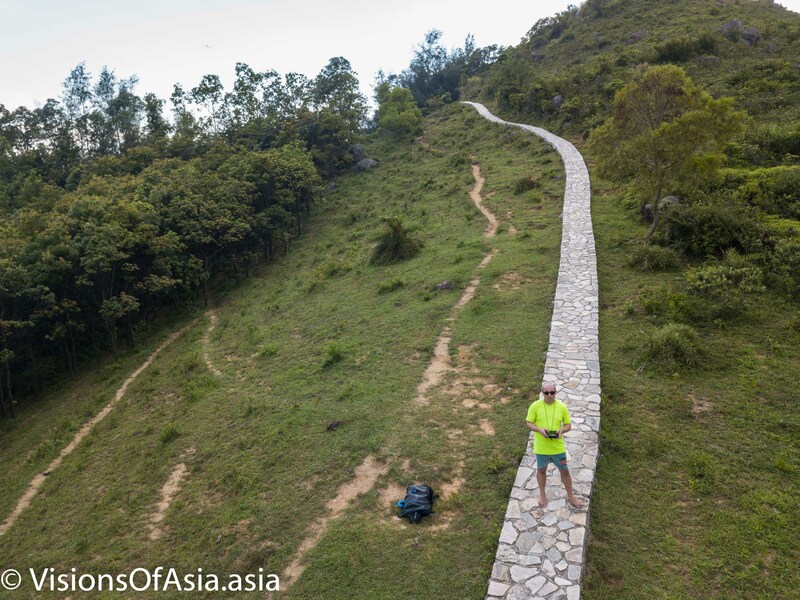 I met Matthew who was coming from Shatin, near to Tate’s Cairn, where I managed to fly my drone. As the scenery is gorgeous, I managed to take a panorama pictures with my Mavic Pro. To do this, the drone takes about 21 shots and stitches them together (in fact, I stitched them in post-prod under Lightroom). The result offers a gorgeous view over the whole area. Around Tate’s Cairn and Kowloon Peak, it is fairly civilized as there are practicable roads around. It changes when you get around Kowloon Peak and down to Gilwell camp site. 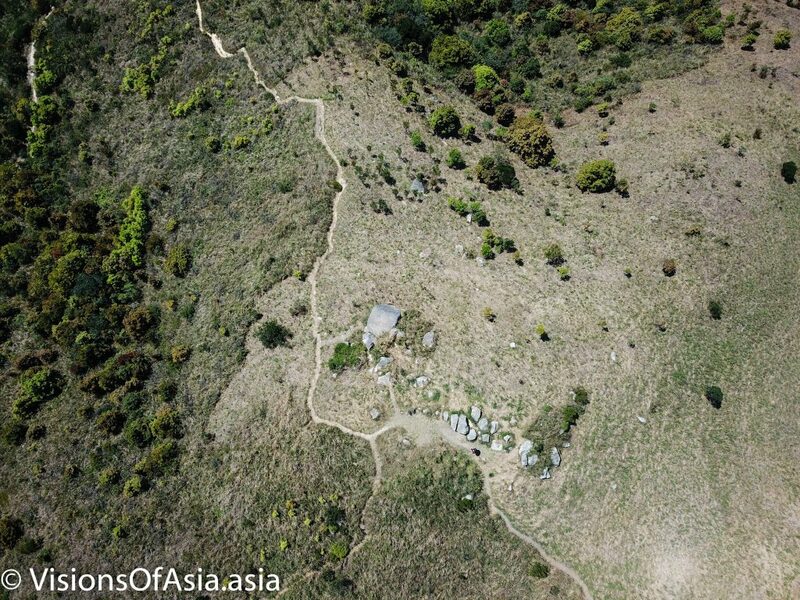 just near the camp site, there is a small mountain called “Tung Yeung Shan“, where a small (partly build) track leads. 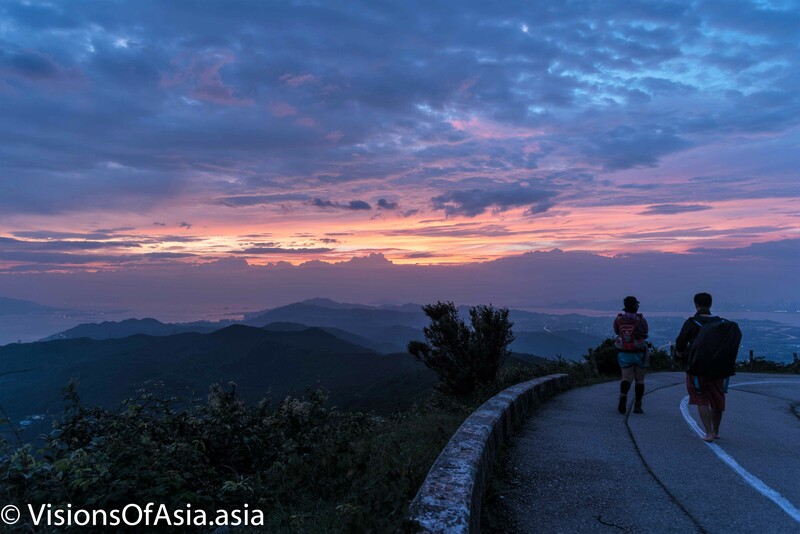 Tung Yeung Shan often pales from its proximity with the famous Kowloon peak and its “suicide cliff”. So, only the most passionate hikers pay attention to the mountain on the right, yet, although not as spectacular or difficult as its big brother, this little mountain can be fun to explore. 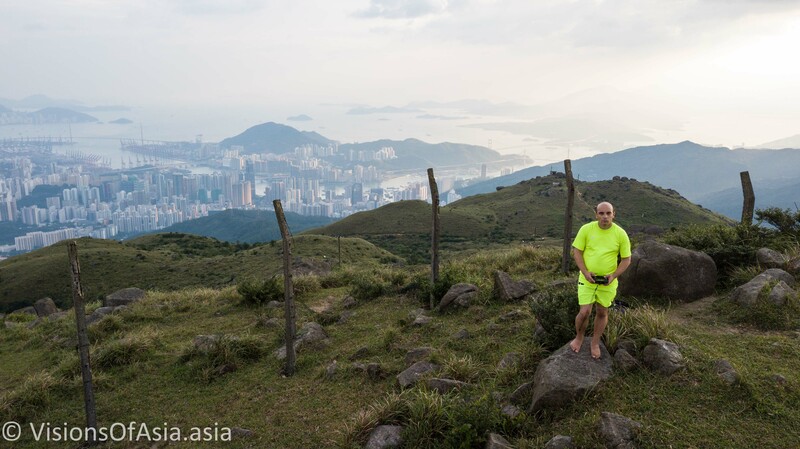 An unremarkable small mountain in Kowloon. Climbing the mountain is pretty straightforward as can be seen in this video. Where it gets tricky, is once at the top, when you decide to follow the trail (there are some discrete markers here and there, but the trail is not much used, so you must really search for them among the high grass). 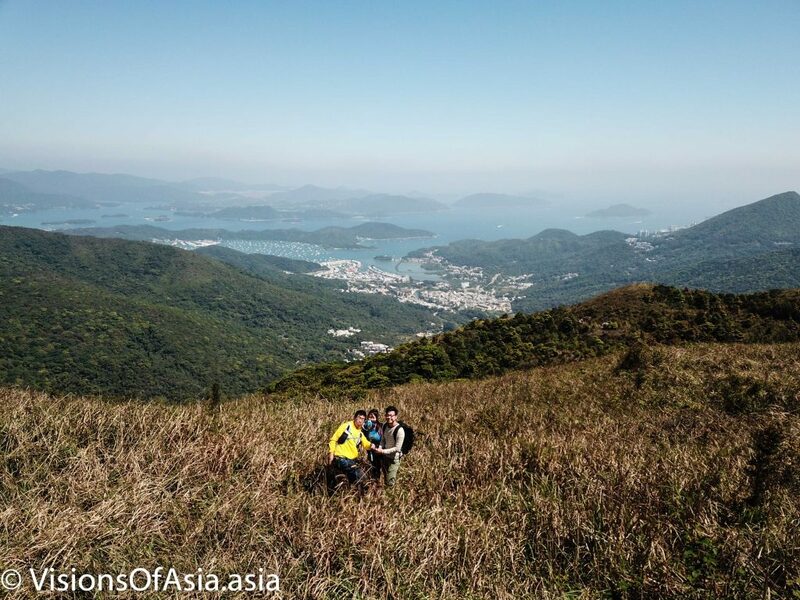 The view at the top offers a perfect perspective on both, Sai Kung and Shatin. A few months ago, I managed to capture a perfect picture of a group of young hikers on the same mountain. As this was a first time exploration, we relied heavily on trail markers by previous hikers. This worked well, until we got down from the mountain. Then, at a point, the trail got lost in the middle of a woody area. The words “Nel mezzo del’ camin’ di nostra vita”, came to mind, and I pictured myself as a new Dante lost in the forests of life. We then had to do some exploring in the middle of an unmarked forest. In the end, hearing voices of other hikers, we finally managed to retrieve the main route. For a barefooter, while descending, the most annoying part is those cutting edges of cement steps. Even more so than the twigs or small stones sometimes lodged in the middle of the steps. Cooling down my bare feet in a side stream. We finally exited in a little town closer to Shatin. Exhausted by our exploration and the heat, I headed straight to get some drinks, while we decompressed after the gruesome exploration. During our trip to Barcelona, we took advantage of having a car to drive all the way to the Monstery of Monserrat. A beacon of Catalan culture since the IXth century, when it was founded, this Monastery survived one millenium of upheaval. The most serious threats to the monastery being the depredations by the Napoleonian troops in XIXth century and the Spanish civil war in the XXth century (23 monks were killed by Republicans). Today, it is a place of pilgrimage, of tourism and also of hiking due to its magnificent views. 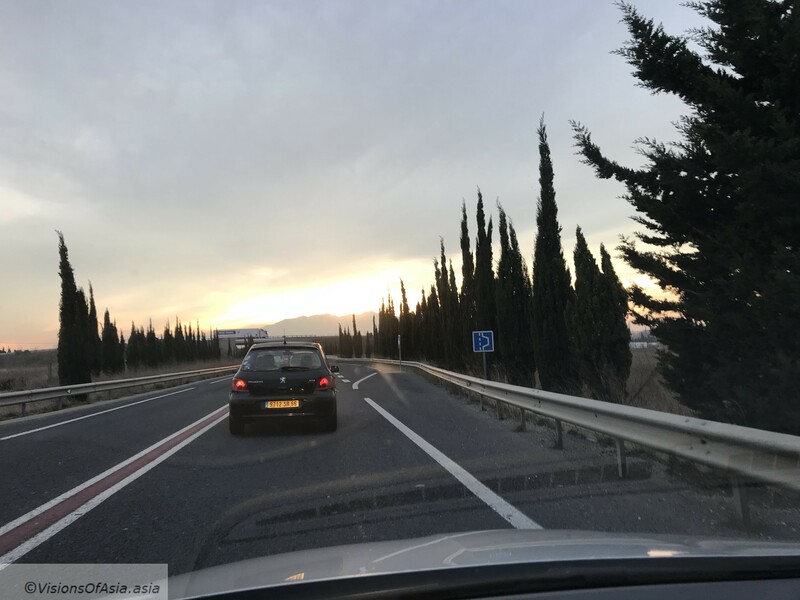 The first part of the drive is pretty much boring, as it involves taking the highway C-58 out of Barcelona for about 45 kms. Ordinary drive, ordinary traffic, so not much to say about it. 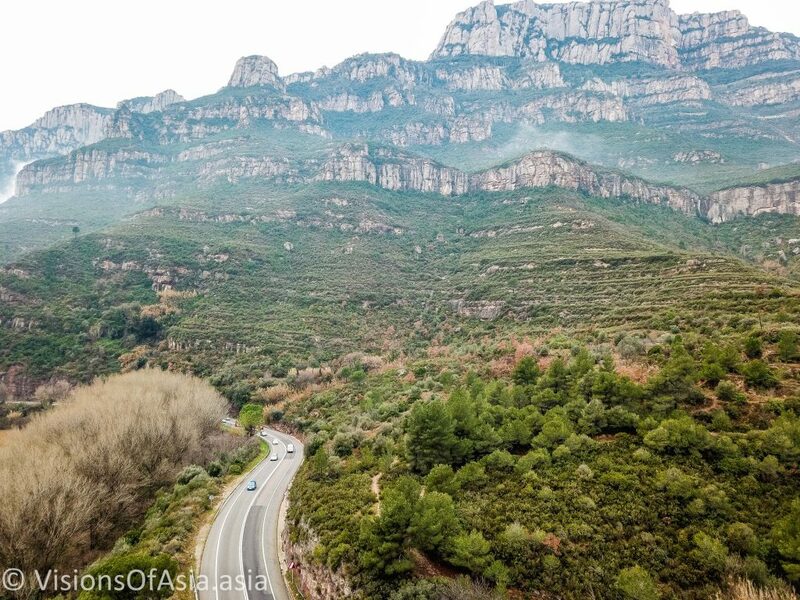 It starts getting interesting when you reach the area of Monserrat, as you see high gorges arising and the road starts making twists and turns. 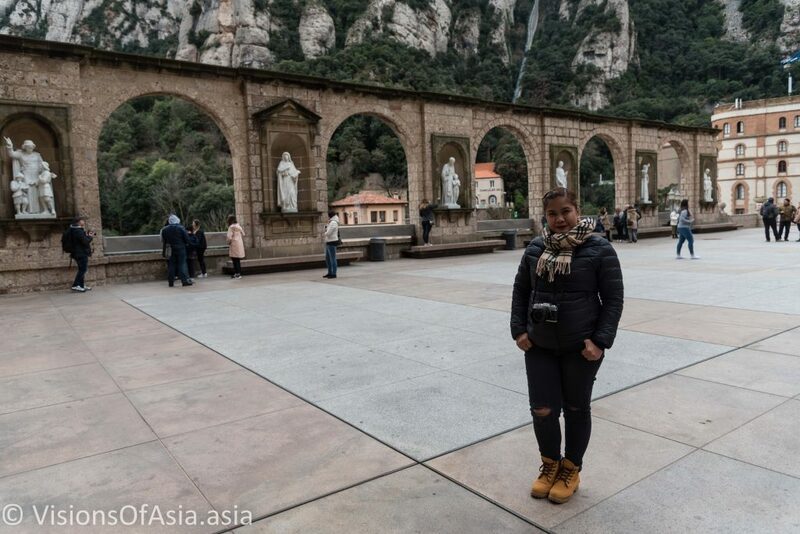 As you arrive near Monserrat, the twisting road starts being surrounded by high gorges, which prepare you to the elevated position of the Monastery. 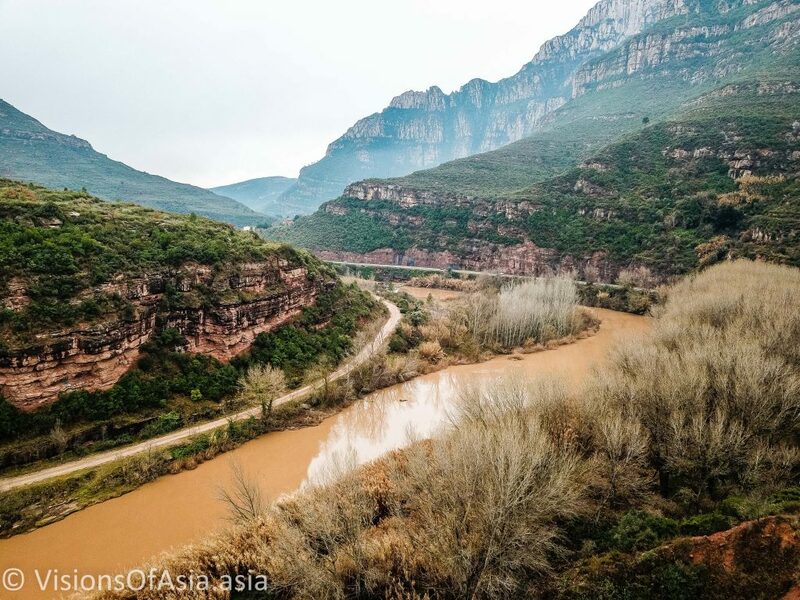 The gorges of Monserrat seen by drone. As we were around, we managed to take a “dronie” in those gorges. The beauty of those gorges cannot be stressed enough. It is a wild and beautiful area. Besides being an important monastery, Monserrat was also one of the first places where Catalan language was born and developed. In that respect, one of the most beautiful hymns in Catalan is “El Virolai”. While I did not get the chance of hearing this hymn during my visit, you can have a rendition below. It is absolutely profound and moving. The monastery of Monserrat is built on the top of the mountain. To reach it, you can either take the cremallera, or you can also climb a hiking trail right to the top. 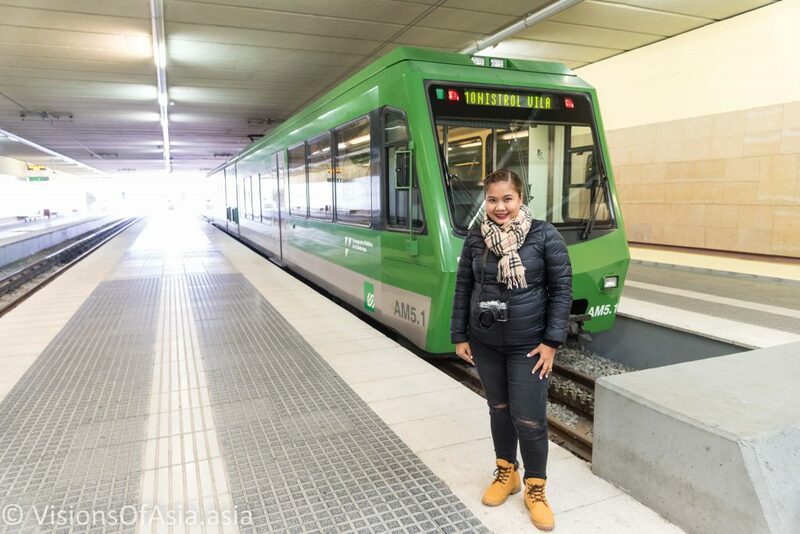 The views from the cremallera are just gorgeous, so make sure you are sitting on the left side of the train for pics. The Cremallera goes all the way to the top of the mountain, near the Basillica. 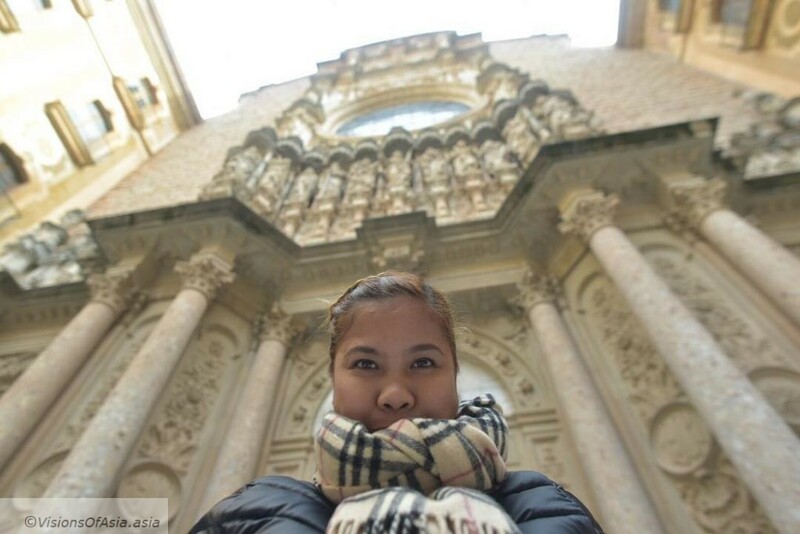 The basilica of Monserrat was originally built according to the Gothic style. However, it was heavily damaged during the Napoleonic wars, and thus had to be rebuilt towards the end of the XIXth century. Today, it is thus not really the IXth century monastery and basilica that you will be seeing but something more recent, with the facade built in 1904. Mitchy before the Monserrat basilica facade. The church itself is very beautiful. 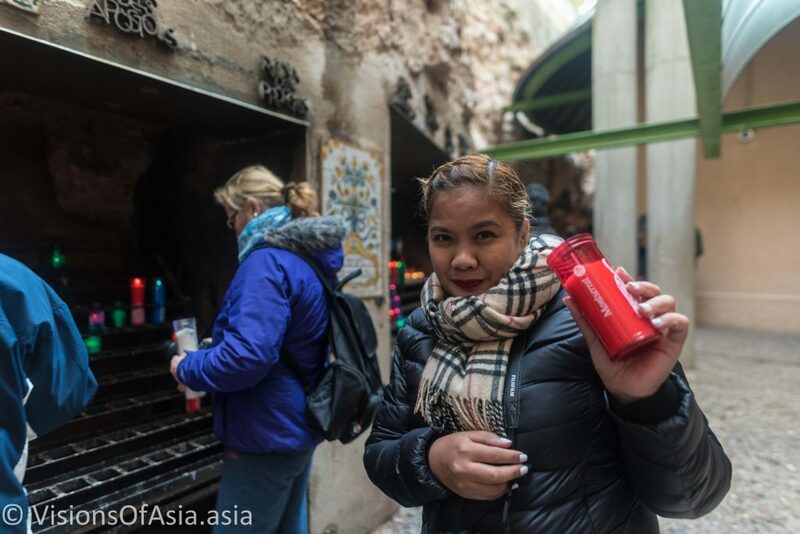 After WWII, a new area was built to hold the Black Madonna statue of Monserrat. This “Black Madonna” is not black by design, but the wood in which it is sculpted darkened with age. Thereafter, successive restorers painted the statue black. Originally, legend had it that it was sculpted in Jerusalem, in the early days of the church, some 2000 years ago. Although not as old as that, it seems the statue must be dating back to the late XIIth century. 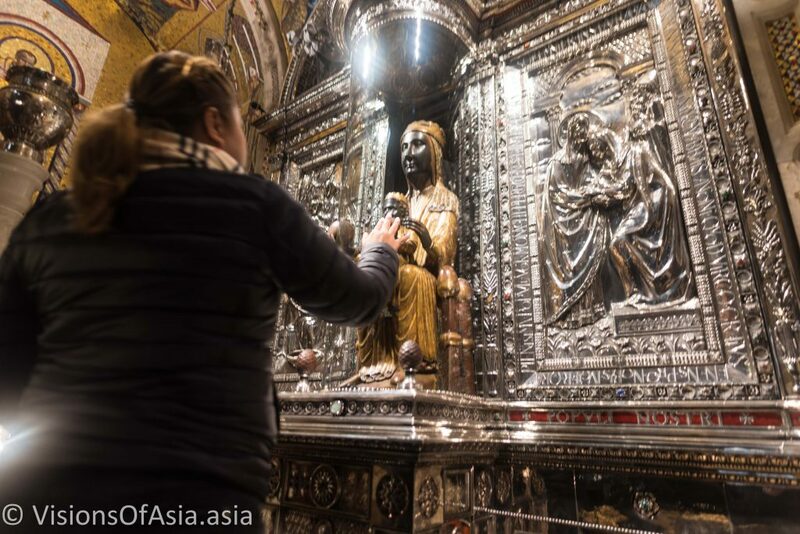 There are very few Black Madonna statues in Europe, the other most famous one being in Czestochowa in Poland. Its importance in the Catholic religious history cannot be understated, as it is before this very Black Madonna that Ignatius de Loyola lay down his weapons, before creating the Company of Jesus or the Jesuit order as it is known nowadays. For Catholics, it is an important moment and something to be thankful for. After you exit the statue display area, you arrive at an area known as the “Ave Maria camin”. 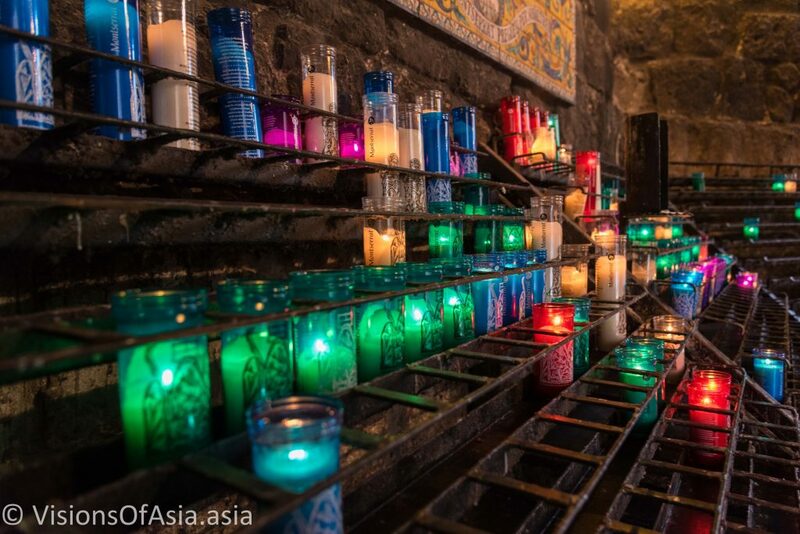 It is a long path alongside the exterior of the Basilica, where you can light candles (which my wife did, of course). The area is also interesting for some atmospheric pictures. Candles always have something warm, both in their light and in the symbol they represent for us. The multicolor view of the candles allows you to take a quite colorful picture of the area. 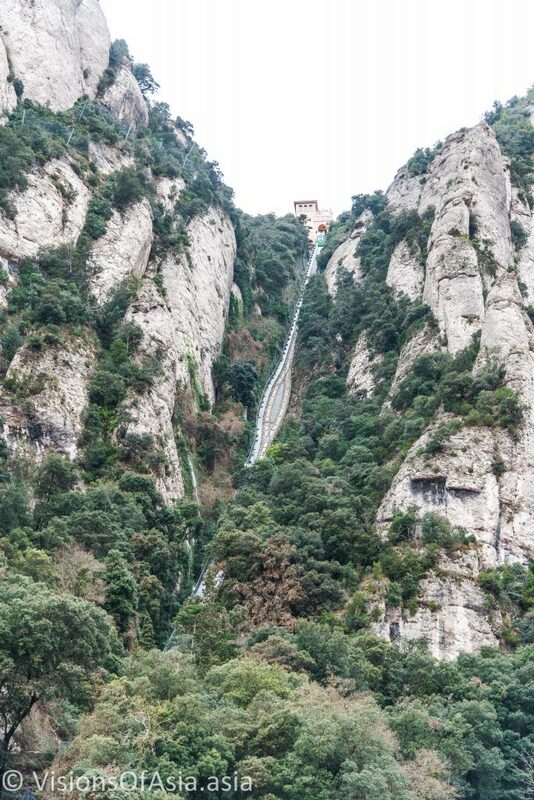 The vertiginous climb to Monserrat’s Saint Jerome. 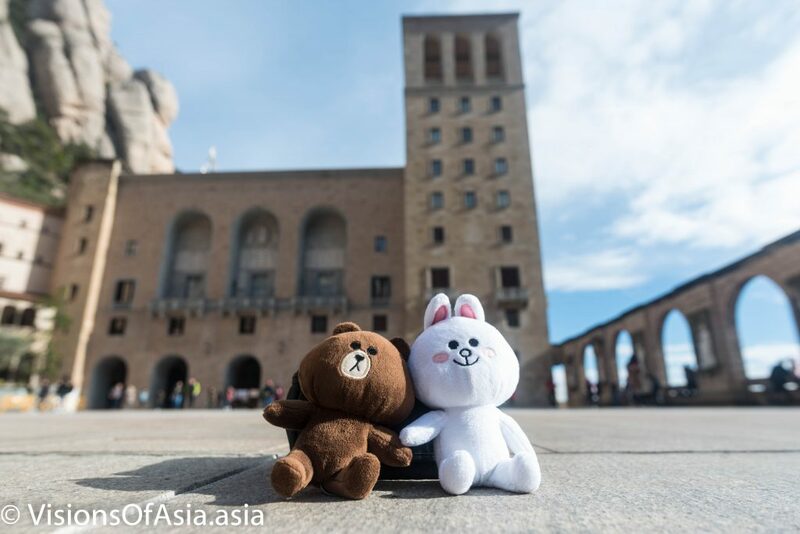 Before leaving, we did take a picture with our alter egos, Cony and Brown in from of the Monastery. It was a way of expressing both, our appreciation for the place and our personal love stories with those lovely characters of LINE. In conclusion, if you are in Barcelona, the Monastery of Monserrat is too unique to miss. The views and the location of the monastery are just amazing. The spiritual experience is also wonderful in this place, and you can understand the appeal of this monastery for so many centuries. A little less than one year ago, I had started my history of barefoot hiking, by electing to climb suicide cliff. 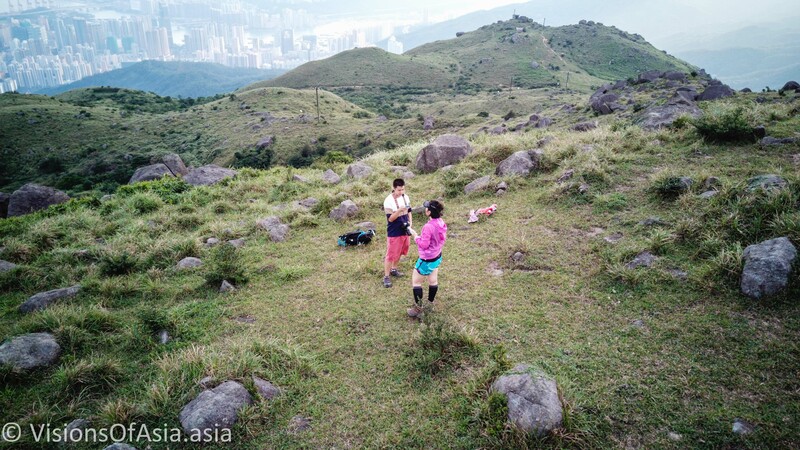 Since then, I climbed several other times on Kowloon Peak, some times by night, other times with my daughter… But I did not go back on the Southern ridge, climbing the steep walls that lead to suicide cliff… Until now! In October, I started my second barefoot hike on suicide cliff. As suicide cliff can get quite frequented later during the day, it is preferable to climb in the morning. I thus prepared myself to start my hike around 9.30 AM, and obviously, even if not recommended, I climbed alone. Early departure allows also to skip the issues with sun beating down on the mountain later in the day. I started off barefooting from home. While initially, it was uncomfortable doing so with the guards at my condo, with time it got easier as I tend now to run and hike barefoot quite regularly. What changed from one year ago? To be honest, no huge changes affected the trail this year. 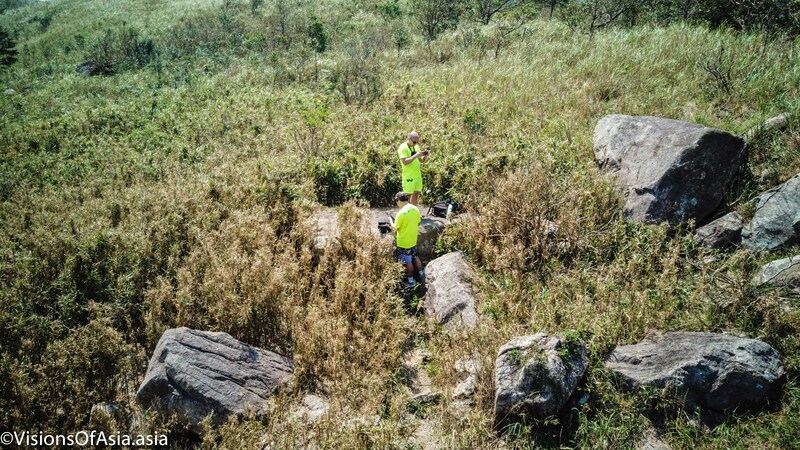 There were however two noticeable differences: a small tree fell across the trail at the beginning, consequence of the typhoon Mangkhut, and there is now a stark warning about climbing to suicide cliff. Warning board on the Southern ridge route to suicide cliff. These boards are also affixed at the other main entrance to Kowloon Peak, namely the stairs. 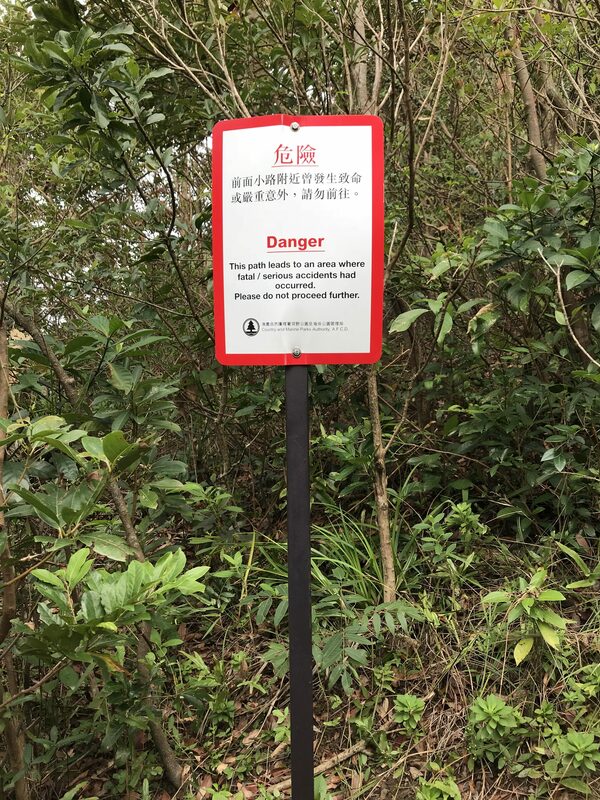 Besides these warnings, the hiking conditions on the path have not significantly deteriorated from one year ago, so hiking is still very practicable. Despite this, it seems hikers get regularly stranded or even disappear on this mountain. It is thus not an endeavour to undertake alone. I provide a walkthrough in this post, but please do not climb the mountain alone if you are unfamiliar with the place. As this time, I had a gopro camera with me, I filmed the main parts of my climb, mainly to give a feeling of what it is to hike on this route. I would invite you to watch the climbing videos in order for you to better understand the challenges, especially if you plan on climbing for the first time. The start is taking place in the forest as starters. The beginning of the climb is not really serious. Most of this path takes place within the forest, and you can grip to rocks or branches to secure your climb. The real technical part of the climb starts once you are out of the forested lower part of the mountain. At a point, you are going to reach a fork in the path. To the right is the most challenging path (which eventually joins the first one), but I do not recommend using that path. One of the reasons being that I never took it, the second being that it is way more sandy than the other side. At any rate, I filmed the passage across the small stream, but be aware that the ropes which have been placed there are used and should not be relied upon. The passage of the fork leading to the second half of the climb. The second part of the climb, once you are out of the bushes is something of a rock scramble, more than a hike. You need to use all of your body to pull yourself up. This is a quite physical effort, which means that you can easily be drained after climbing the rock for two hours. First stage, where you come up, above the bushy part of Kowloon Peak. After all the rock scrambling, you will arrive to a plateau, where there is sufficient space to ensure that you can rest. The view on the city is also quite gorgeous at that point, and it is where you will take a breather after the intense efforts. This is where I flew my drone too, but had to land it quickly, as the wind was threatening to fly it against the mountain or have it escape my control. For being short, this video does a good job of providing a contextual view of the mountain. I then resumed my climb, as it was the final leg towards suicide cliff. Before getting to suicide clfif, proper, you must walk a tight ledge. Explaining how it looks does not help much, and you will only feel the thrill when you walk it yourself. Needless to say, while looking very risky, this ledge is large enough to be walked along comfortably. Nevertheless, it is best to be slightly slanted towards the mountain, in order to avoid any loss of balance tipping you cliffside. Rock scrambling does not end with the suicide cliff. Not in the least. To get away from suicide cliff, you can only go down by the same path you came up (very steep) or continue climbing upwards (and that involves some more rock scrambling). While not terribly technical per se, this involves however passing on a narrow ledge giving on a ten-meter cliff. Here again, unless you are scared of heights (in which case you should not even be attempting this climb! ), no real issue. Just remember that taking your time and advancing prudently is key to hiking safely. Once you get over that part, then, you must still get around a huge boulder, and it is not obvious unless you have already been there (although you can just follow the trail in the vegetation). The final leg of the hike involves both getting around a communication tower with barbed wires and climbing to the radio tower and the helipad. The last part of the hike is going down the stairs. Under no circumstances think about taking the “shorter” way down on Jat’s incline side! That route is treacherous and extremely dangerous, please always take the stairs, they present no risk at all. As a conclusion, my advice is once again, to be very careful. It is always prudent to start a hike on a new route with someone who already knows the route. And if you wish to start a hike barefoot, make sure you recognized the terrain beforehand and that you pack a pair of shoes (there is no shame in adapting to the terrain). Finally, don’t think you need to prove anything by taking the most dangerous routes when there are less dangerous ones available. Kowloon Peak is a famous mountain, but it stays a mountain. It must be respected and handled with caution. Safe climbing! One year ago, in October 2017, at night, out of sheer despair, I cast aside my flip-flops and set off on my first steps barefoot running. Slightly painful though they were at the beginning, soon, these steps gave way to the elation of being able to run once again, about one year after having undergone an ACL reconstruction. Since then, over one year barefoot running and hiking, I kept pushing the envelope, among others barefoot hiking on Suicide Cliff. It is traditional for barefoot running proponents to advocate a slow start, and this probably makes sense for most runners. I must say that since I have lived in Thailand, I generally do walk barefoot at home and use wooden sandals most of the time, otherwise. When trying to resume running with shoes, the knee patella pain was too present to allow me any form of recovery. As a last resort, I switched to barefooting – and to be quite honest, always wanted to run barefoot. As such, and rather counter-intuitively, my start was immediately with 1/2 hr runs and 4 to 5 kms each time. Though I was rather out of shape when I started, I did not suffer serious inconveniences when running. At the beginning, and mostly an effect of bad technique, I did have a few blisters. But beyond that, what I did was avoid running every day. I started by running twice to thrice a week, which gave time to the tendons to adapt. My feet, in themselves, did not suffer at all of the barefoot running, on the contrary. Recently, I acquired a garmin smart watch. This allowed me to identify more precisely my running cadence, and it seems very close to the 180 steps per minute which are the optimal cadence at which barefoot running should be practiced. The advantages of barefoot running, beyond allowing me to get back to the point where I can run even with shoes, are numerous. I realized when hiking barefoot lately, that my ankles and body muscles have grown stronger and can now ensure stability in all terrain, especially in the mountain. I did not have any injury, except a sensitivity once, to the Achilles tendon, which got solved simply by taking two consecutive days of rest. Running barefoot also helps gaining in self-confidence as it is something putting you under the spotlight. Only people with a relative confidence in themselves can do this exercise. Another advantage of barefoot running is the comfort in which you feel even after several hours running/hiking barefoot. You don’t have shoes weighing you down or making your feet sweat. Now the most obvious will be that gone are any pretense at passing unseen or discretion. Often people don’t look at the feet, but when they do, you can be guaranteed to see various levels of shock. People do tend to get surprised when they see someone walking or running barefoot. Some people may react aggressively, as somehow, the feet seem to have a special place in the human mind. Sometimes, the problem is with “conviction-based” barefooters who tend to appear as aggressive in enforcing barefooting as Jehovah witnesses at your doorstep. Your tendons and feet muscle will also be loaded much more than with shoes, and at least at the start, it is important to bear that in mind. Indeed, starting too quick may overstress those body parts and lead to overuse injury as well. The other factor to bear in mind, is that you are inherently more vulnerable barefoot. As such, you generally run or hike slower (especially hiking in rough terrain). The counterpart to this being , of course, that you hike more leisurely and are more in phase with your environment. After all, what better experience than being able to remember the feel of the terrain on a hike on top of the view or the general area? A key word in building up your resistance and capacity to run barefoot is to be consistent. 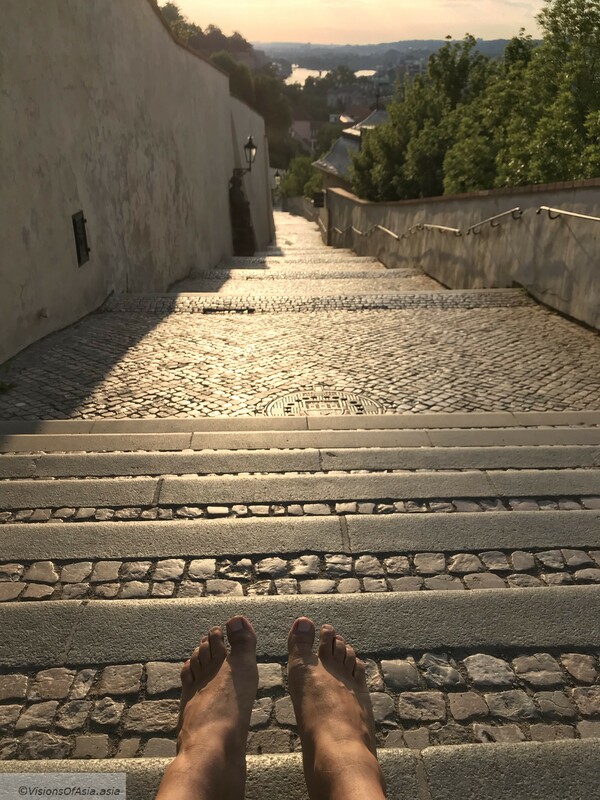 Most of us cannot walk barefoot 24/7, so while we wear shoes, our feet lose some of the benefits of barefooting as well as become softer (which is not always a boon when practicing on rough terrain). The future is probably not a generalization of barefoot running, but the development of a core of consistent barefooters who will serve as a reminder to the other runners that barefooting can be good for health. Obviously, in Asian cultures, where some degree of barefooting has always historically existed, acceptation of barefooting is greater than in Western countries. And then, obviously, there are areas such as San Francisco, where barefoot running is basically impossible given the dirtiness and disastrous condition of the streets. Nevertheless, never mind how gross or “painful” this may appear to you, try running or walking barefoot in the street. 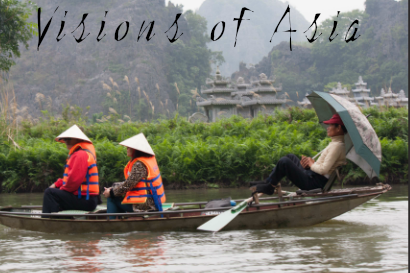 You will be amazed at the sensations and the incredible benefits this practice can bring. And if you need more references, I created a page solely for collecting references on barefoot walking and running. Tai Mo Shan is the highest mountain in Hong Kong, culminating at 957 m. Despite being in Hong Kong for two years already, I had not visited Tai Mo Shan until recently. It must be said that it is a bit out of my way, and I already have the famous suicide cliff near to my place. I even went back there recently, but that will be the object of another post. I went up Tai Mo Shan with the members of a photography meetup, the PASM meetup. We went the day before the Typhoon Mangkhut hit the city, because prior to the typhoon, there is always some marvelous atmospheric effects in the sky. Having missed the bus to Tai Mo Shan, we caught an Uber to be on the safe side. The side benefit of taking an uber was that the driver took us up about halfway up. Being on the side facing Yuen Long, we faced strong headwinds. An attempt to take off with my drone ended in a crash-landing that created some damage to the gimbal, although that damage was not immediately apparent. Despite the wind, we managed to take some pictures on a rocky outcropping. Bailey shooting pics on the protruding rock on Tai Mo Shan. 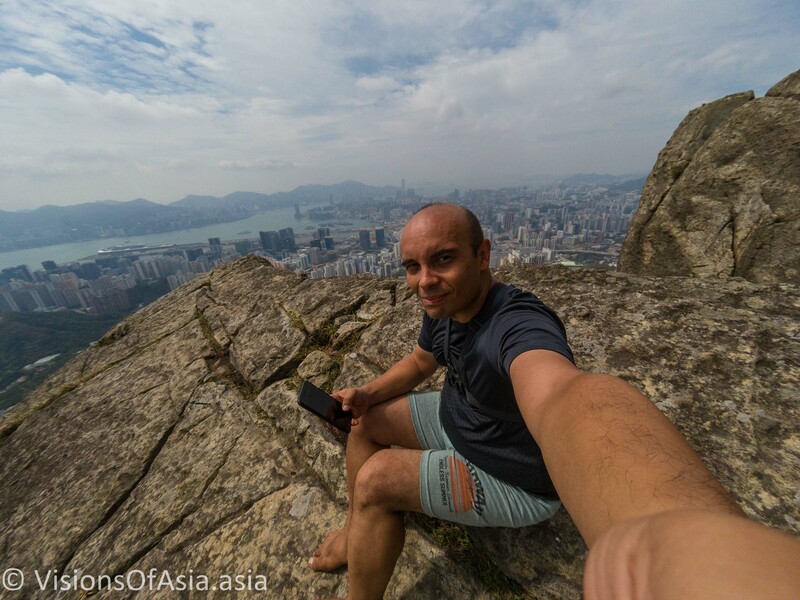 Although we had come halfway up on Tai Mo Shan, we still had halfway to walk, and so, we started climbing. Along the way, there is a viewpoint over the town of Tsuen Wan. 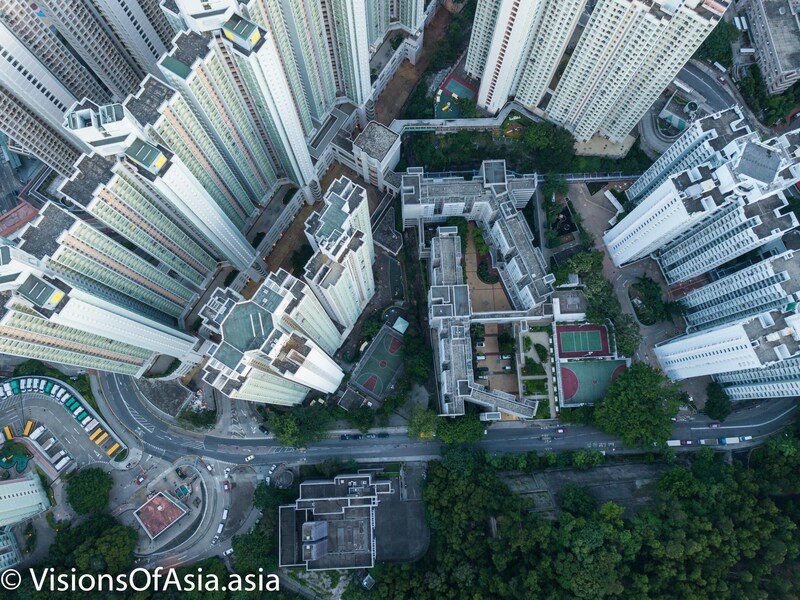 While it is just the habitual cityscape of Hong Kong with high rises and some view of the sea (read: unremarkable), it was interesting to play with the drone around that area. 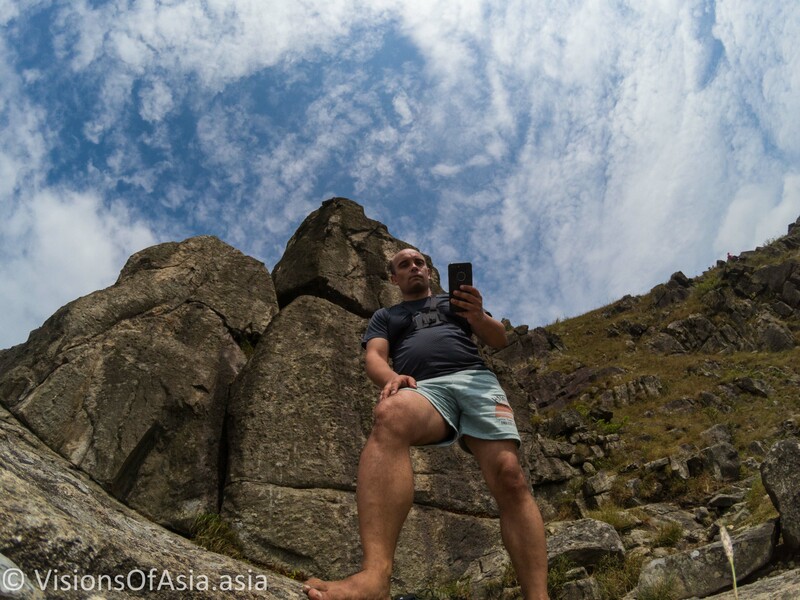 Of course, since the scene was there, I did take a dronie… Barefoot of course, as I was hiking the whole mountain barefoot. 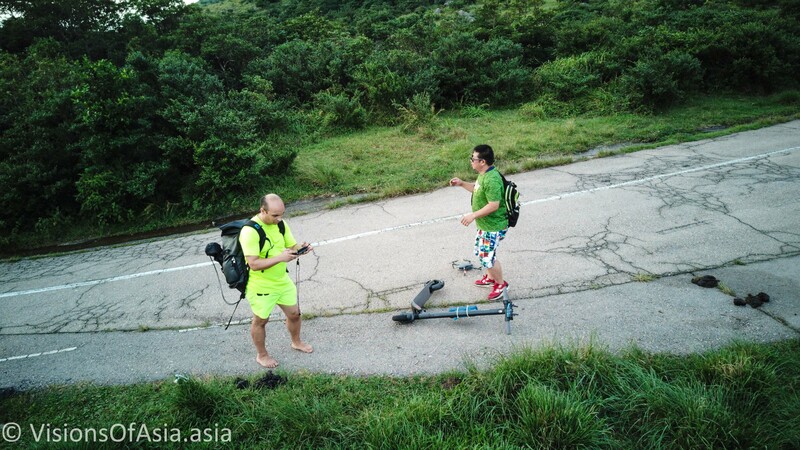 The most fun was when another Mavic Pilot came down the mountain with his own drone, while he was actually riding a scooter. We then exchanged dronies capturing each other with our respective drones. Finally, after having climbed even higher, we came to an ideal position to see the setting sun. We were blessed with some angel lights shining through the clouds which made the sunset quite spectacular. Despite the proximity of the typhoon, and despite being on the exposed side of the mountain (again), there were no gusts, so the drone managed to be quite pliable. 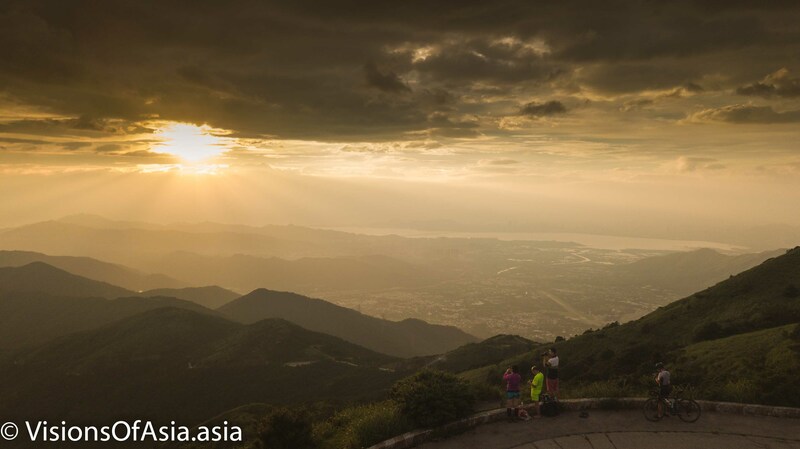 The sunset over Tai Mo Shan. Despite the lower dynamic range of the Mavic Pro, the picture is quite similar to the picture shot with the Nikon D 750. A view of the angel light through my Nikon D750. The reason for the absence of reddish sky is due to the wind which dispersed the pollutants which habitually diffract the blue part of the solar light. Habitually, Hong Kong and Bangkok are gifted with quite spectacular sunsets due to the high presence of pollutants in the sky. An approaching typhoon, obviously disperses these pollutants. 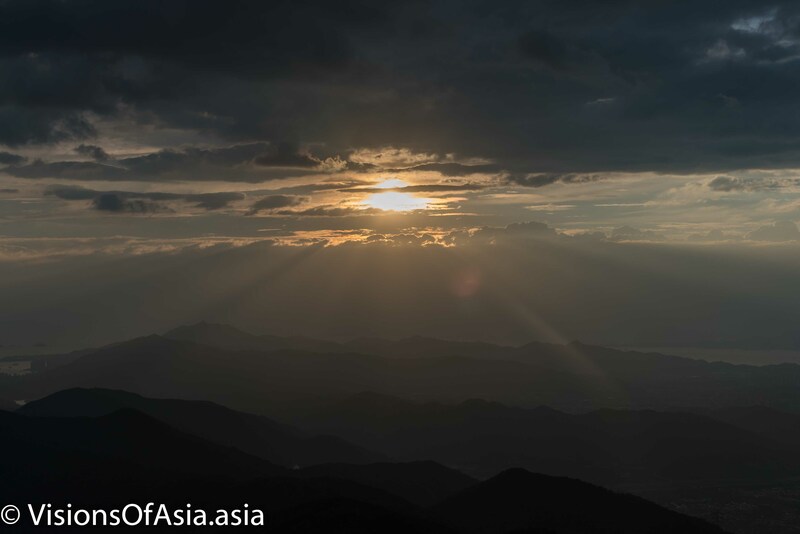 Once the sunset over, we started going down, also to get home on time to shelter from the typhoon. Nevertheless, that is when the sky started showing some spectacular hues. Bailey going down the mountain barefoot. 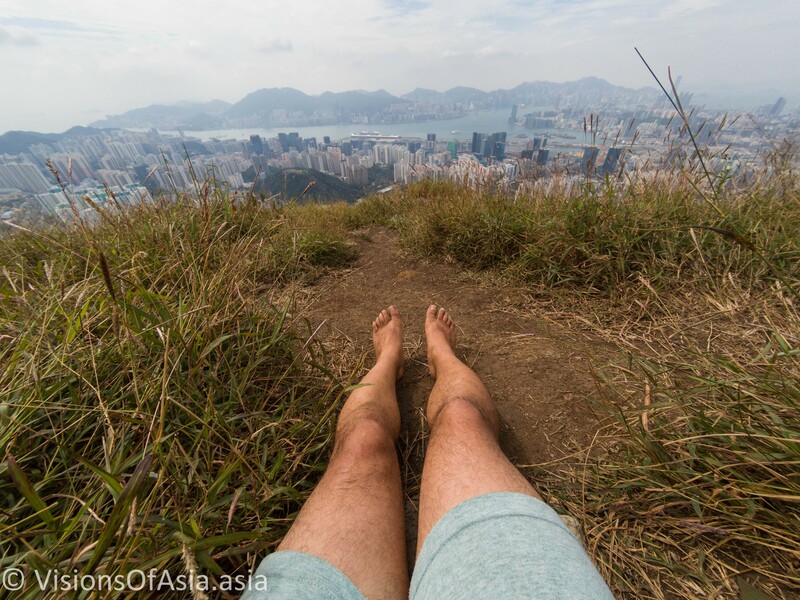 It was the occasion for me to shoot a pic of Bailey who, after a lot of prodding, finally decided to take off his shoes and start barefooting down the mountain. 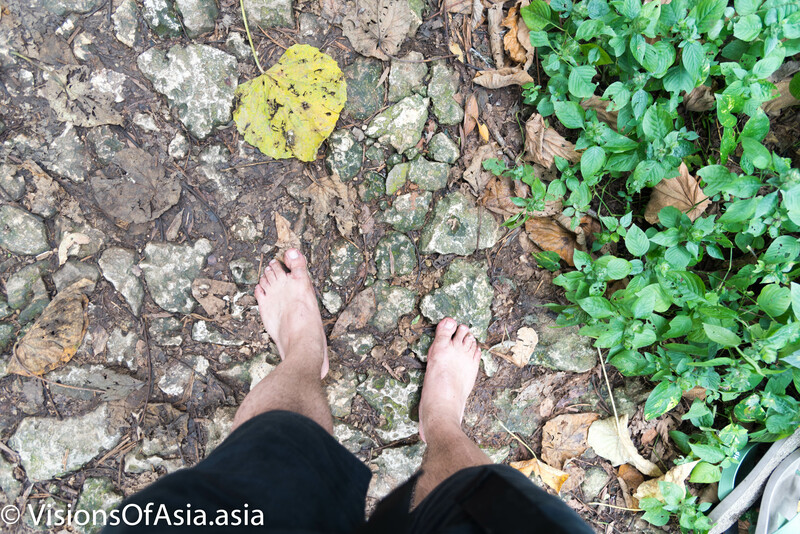 Obviously, I took it to the next level, when I decided to jog down the mountain with my heavy backpack, still barefoot… But that is how a barefoot hike can be as much fun as a barefoot run! We took it the easy way, as we hired an uber which took us up to halfway the mountain. 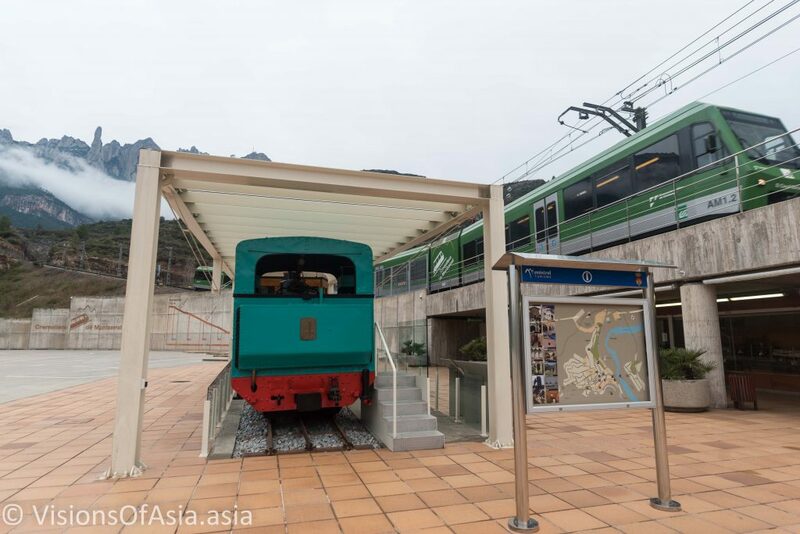 Nevertheless, if you wish to climb Tai Mo Shan more “classically”, you must first head to the Tsuen Wan West MTR station. From there, you grab bus n° 50 and alight near the mountain. From there, it is impossible to get lost, as the path to the top is straight and paved until the end. 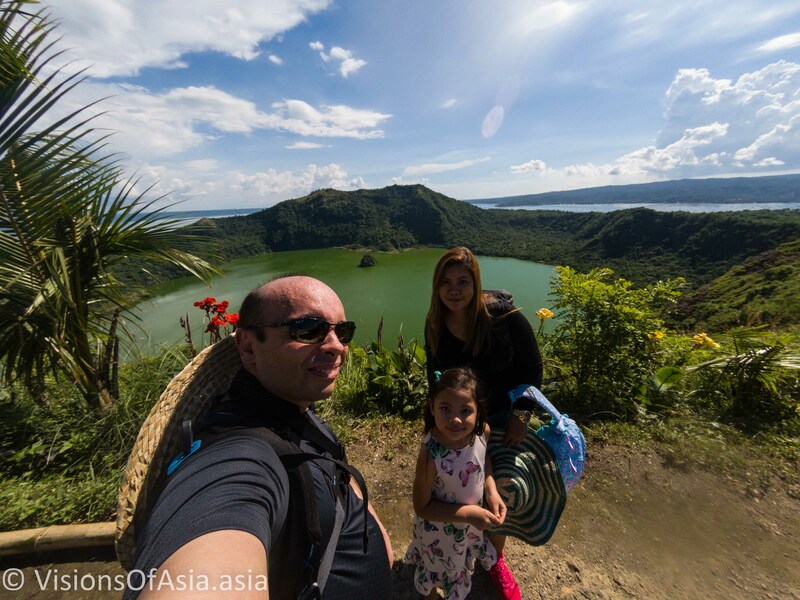 In the series of pushing the envelope on barefoot hiking, this time, I tackled the Taal Volcano, a caldera located some 55 kms from Manila, the capital of the Philippines. 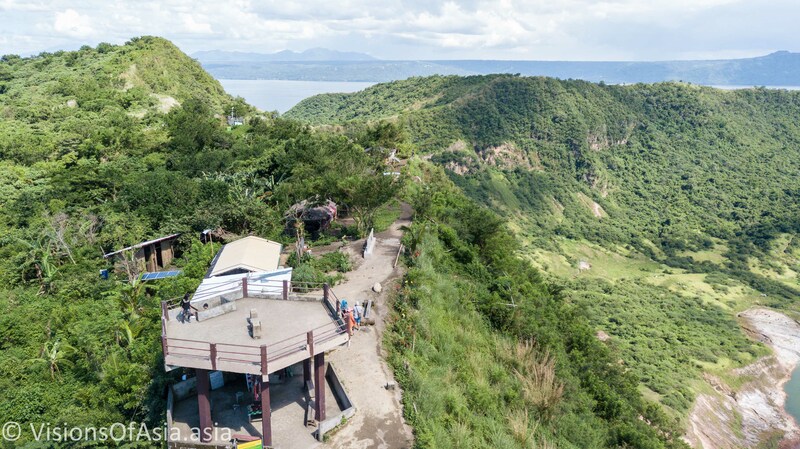 Taal Volcano is a caldera, a super-volcano that is estimated to have culminated at 18,000 feet in prehistoric eras, before collapsing and making it today the smallest (311 meters) volcano in the Philippines. Originally, the crater was filled with sea water as there was a channel opened between the volcano and the bay near Cavite. 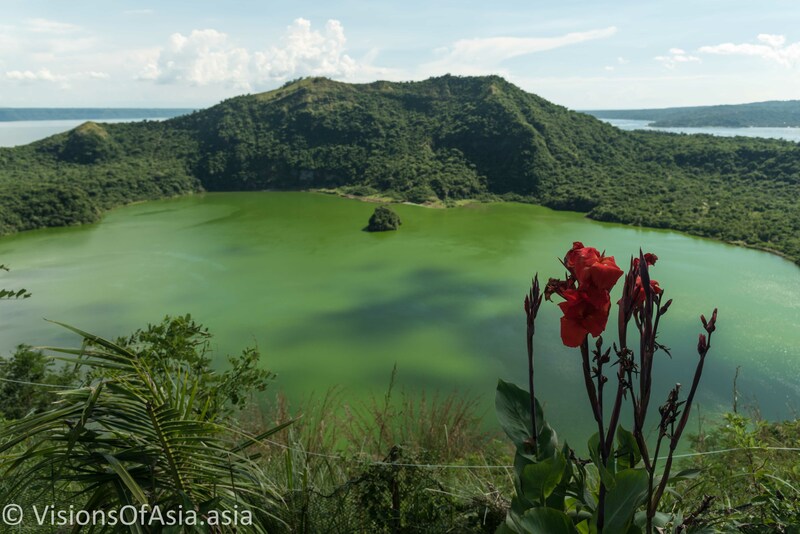 Since then, the channel closed, making Taal volcano a large freshwater body. 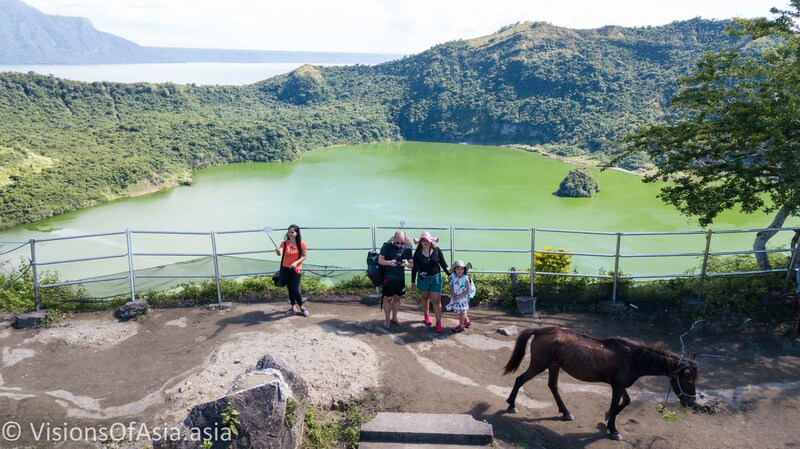 Although it was quite calm when we visited, the Taal Volcano is not a dormant or extinct volcano, it can be quite active, with a huge magma chamber below. In fact, my first visit was in 2012, and at the time, steam was hissing through some vents in the ground. 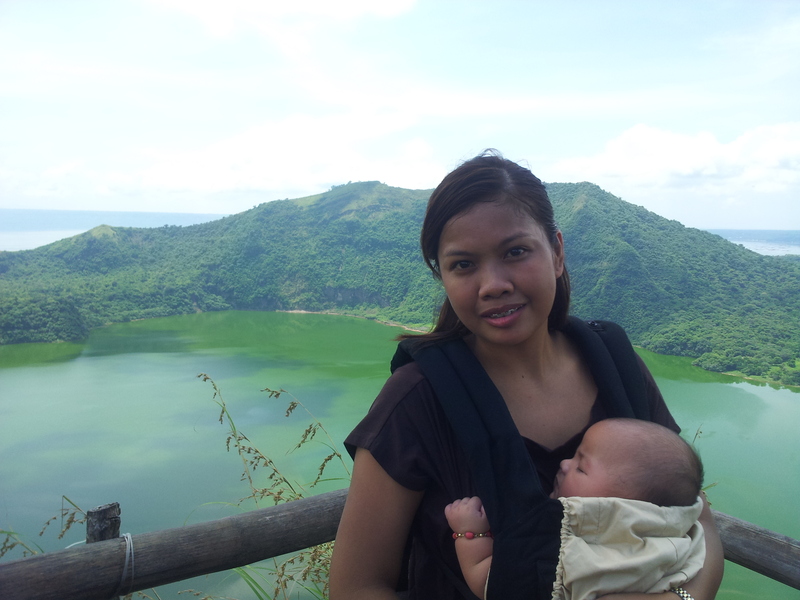 Mitchy and Maria-Sophia in 2012 on Taal Volcano. 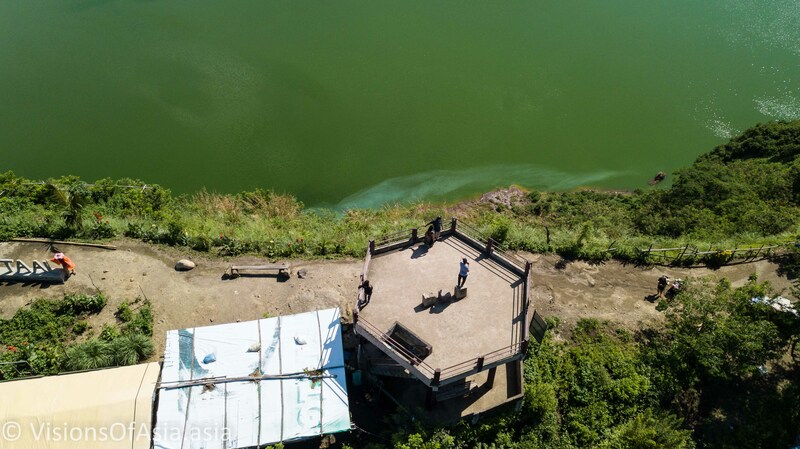 Since then, the authorities have restricted the access to the crater of the volcano island as there have been episodes of boiling water projections down there, or toxic gases. To explain why, it is good to know that in 2012, some people even went canoeing on the crater lake! The one big inconvenience reaching Tagaytay is transportation. 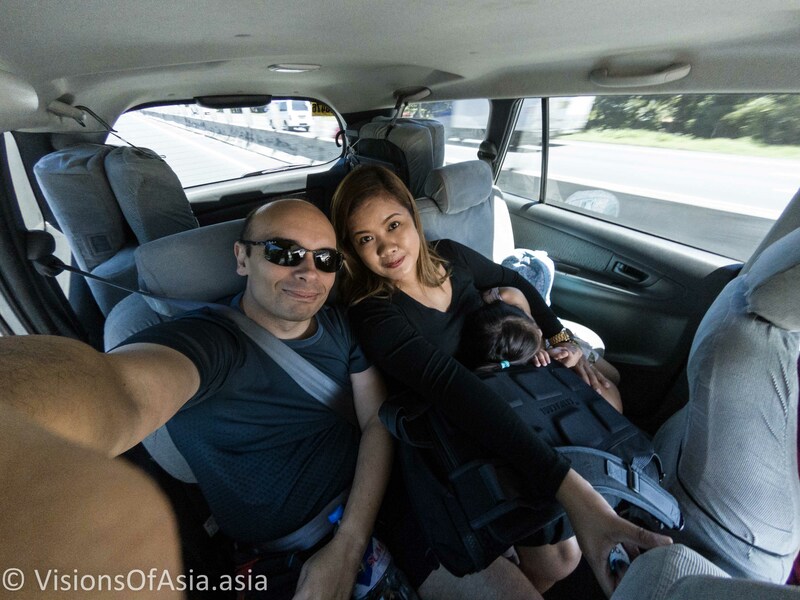 Although it is only 30 kms from Manila, it takes almost 3 hours to reach by car. We took it the lazy way, and just called a Grab car. You must be aware that the app will provide a very low price for the transfer to Tagaytay, which makes it uneconomical for drivers to take you there. So, what we did was to negotiate a price for full day hire and cancel our booking. In all, this costed us 4,500 PHP, but the driver stuck around, hence avoiding us having to roam around finding transportation back to Manila. One caveat however, there is an incredible number of toll fees between Manila and Tagaytay when you take the highway (called “skyway” here). 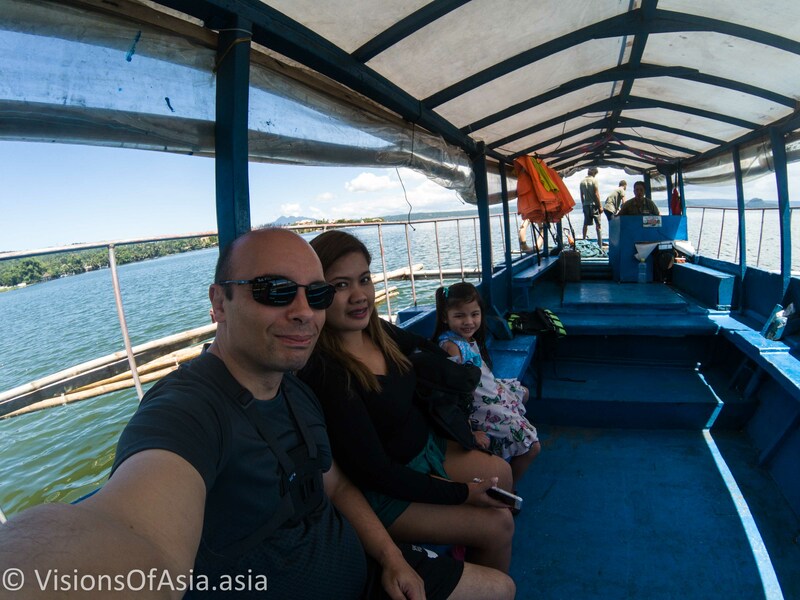 Once you get to Tagaytay, you must find a boat to carry you over the lake. Typically, this would cost about 300 to 500 PHP per head two ways. Since 2012, it seems most of the locals have been replaced by resorts who offer well-organized transfers across the lake, mainly for Koreans. It was thus no surprise that our driver recommended us a Korean-operated resort. 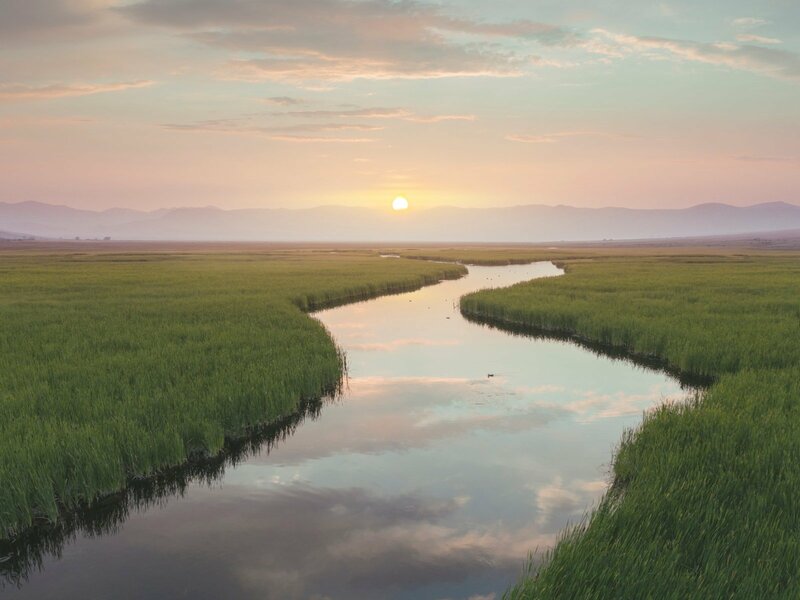 The resort operates an “all inclusive” package which includes boat crossing two ways, horse ride up and down the mountain and (if you wish) Korean buffet. Prices go from 1300 PHP per head to 1420 PHP with meal included. The boats used on the lake for the crossing are those typical “barca”, made of a central hull and two balancers. The lake being originally the crater of a volcano, there are often algae that can get tangled around the propellers. In our case, the pilots had to jump in the water to release the propellers. There are a number of villagers living on the volcano itself. Namely some impoverished locals whose only livelihood is around having tourists riding their horses up and down the volcano’s crater. As we were hesitating about who would take our daughter on its horse, Maria-Sophia announced determinedly that she would ride her own horse! It was thus that she got to climb on her own horse, with the guide taking a ride behind her. The climb up is not very strenuous and the cliffs are not that steep. So, riding a horse seems a bit too much. Nevertheless, many tourists fall into the trap, but it is extremely uncomfortable to ride. In my case, it seems my heavy photo backpack was causing the horse to have some issues with balancing, so my guide kept on telling me to keep my balance. I rode the horse barefoot, but later, when they needed to rearrange the saddle (a close way to the top), I dismounted and carried on on foot. Strangely for people who keep climbing the volcano with mere flip-flops, the guides were a bit scared and surprised to see me hike up barefoot. Nevertheless, most of the terrain is sandy, with some edgy stones in some places. As such, I would not deem it as one of the most challenging hikes I did. 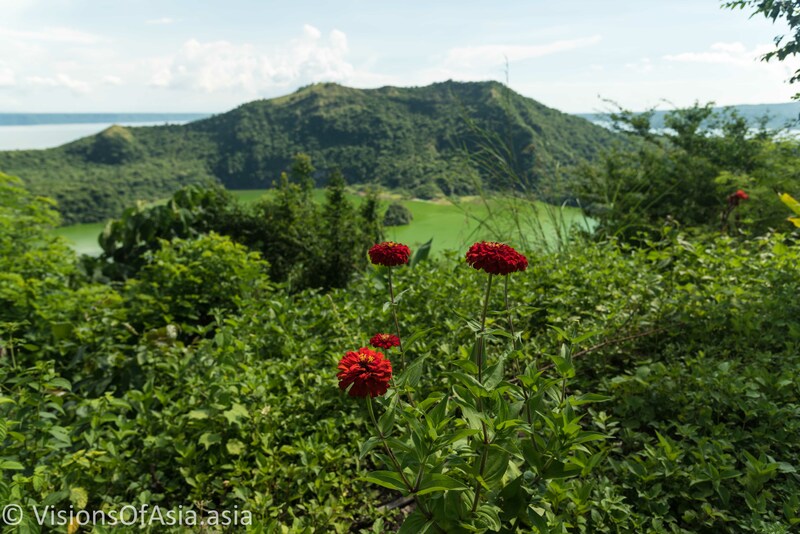 I mentioned earlier, the Taal Volcano is actually a caldera, a sort of super-volcano. This explains why there are actually two craters: a first, the largest, being the calderas’s main crater, and a second one which appeared later in the center of the lake. This gives the volcano that peculiarity of having two lakes in its midst. The best way of having an idea of the gigantic nature of this volcano is through drone views. Here, below, a view of the observation deck set up on the rim of the crater. The observation deck and in the background, a glimpse of the main Taal lake. This video also probably gives you an idea of the beauty of the place. 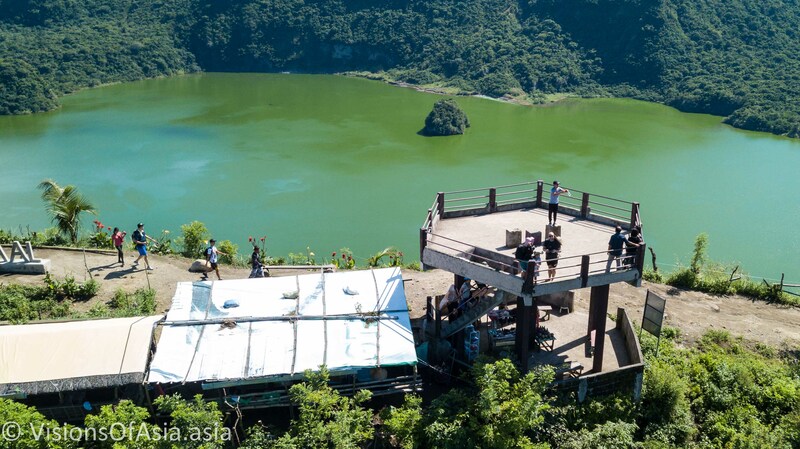 Taal being this natural curiosity, it is also one of the main touristic attractions for the area. They did quite some nice work to make the crater’s surroundings likable for tourists, like planting flowers. A flower planted on the rim of the crater brings a touch of color to the greenish tone of the water. Similarly, a bit further, they planted red carnations, again, providing some color in the otherwise greenish tone of the crater. The whole family then took a dronie and a selfie before the crater. Our daughter was rather disappointed that she could not see lava or magma as in a “real” volcano. But this volcano is quite active. All the more as since our last visit, it is prohibited to walk down to the crater’s edge. A gopro selfie before the crater. As I walked along the crater, a Filipino seeing me barefoot took out his flip-flops and started walking barefoot too, giving me the thumbs-up. After having suffered with the discomfort of the horse ride, I decided to go down the mountain barefoot. As the path was downward and furthermore, I was walking on a terrain that was mostly dusty, I arrived to the end point at almost the same time as the horses that departed with me. And this is only logical, as the horses can only ride as fast as their guides let them. Once again, the views going down were absolutely gorgeous. Japanese say that only fools attempt to climb mount Fuji twice. 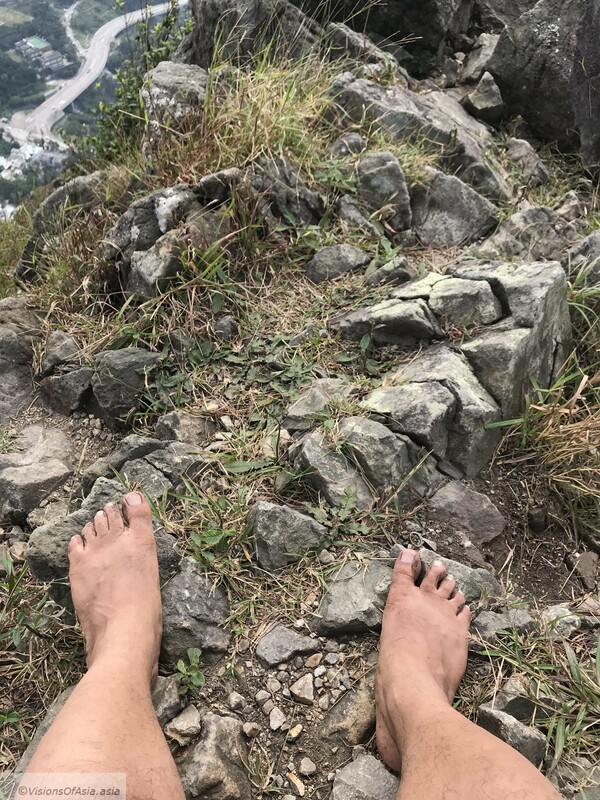 In this case, it was the second time I climbed Taal Volcano, but this time, I did it mainly on (bare)foot. It was nice to come back to the place several years after my first visit, and more particularly to bring back my daughter who had visited the place as a baby. Everybody knows Cheung Chau and its crowded streets. 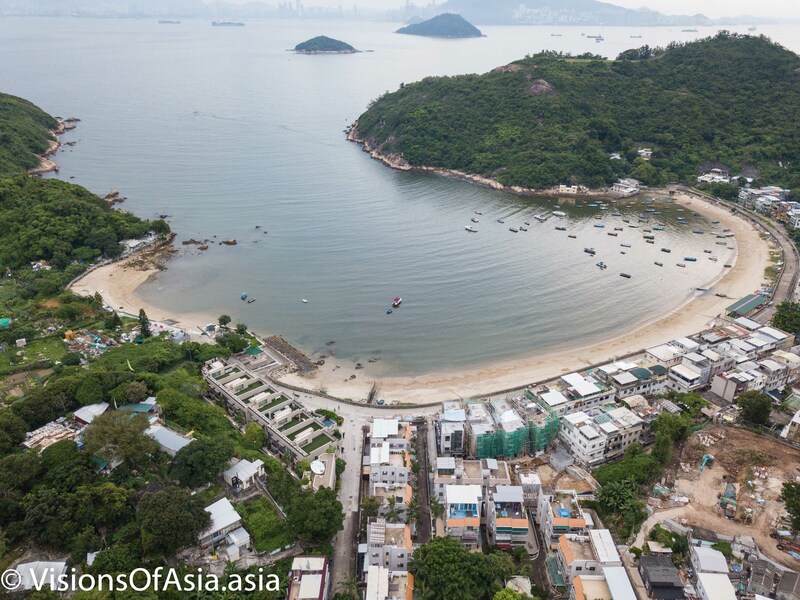 Now go a bit outside of the beaten path and you may come across Peng Chau island, a small island which feels pretty much more like an oasis. Until the 1970’s, Peng Chau was a bustling area of industrial production for two main products, namely lime and matchsticks. Lime was obtained by burning oyster and clam shells, corals, to produce the final material which was then used in various other industries. After the 1950’s lime was used less and less in construction, and eventually the lime kilns went out of business. The matchstick production faced a similar fate when disposable lighters appeared in the 1970’s. Today, all that remains are old buildings (which I did not visit on this occasion). 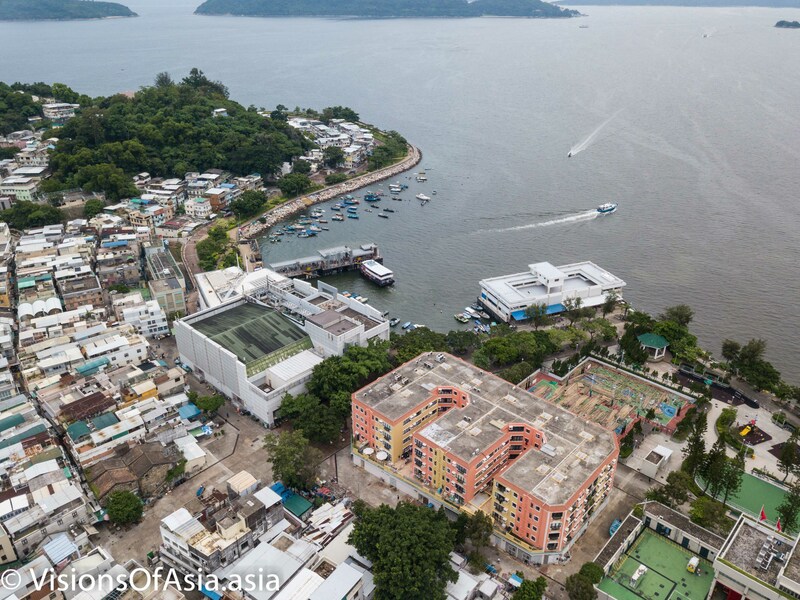 Cheung Chau might be appreciated and invaded by tourists, but Peng Chau has nothing to envy to its big neighbor. Actually, it might be worth saying that Peng Chau beats Cheung Chau by the peace on the island. Being a small island, the area to cover is pretty limited, but with less tourists around it is much more pleasant. Nothing beats thus the deserted beaches of Peng Chau. 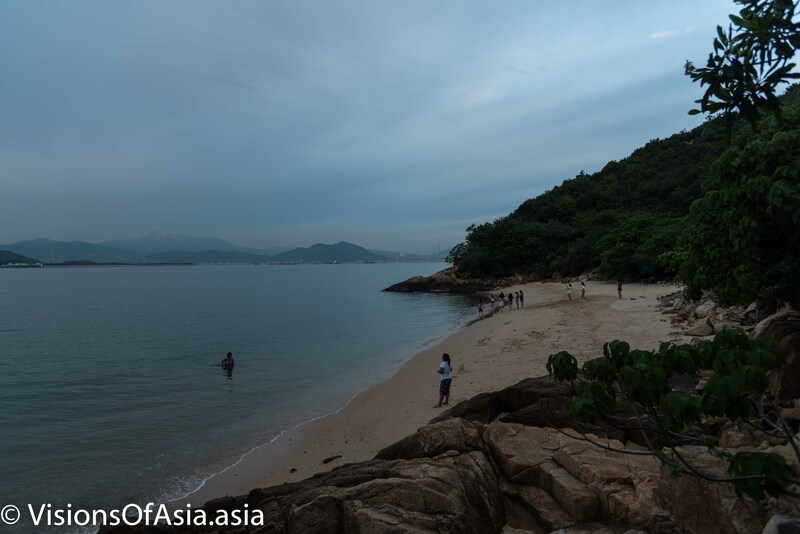 Nothing to do with the crowds of Cheung Chau and the numerous glass pieces that can be found along the beach. The island built a very convenient hiking path which was a pleasure to trod barefoot. 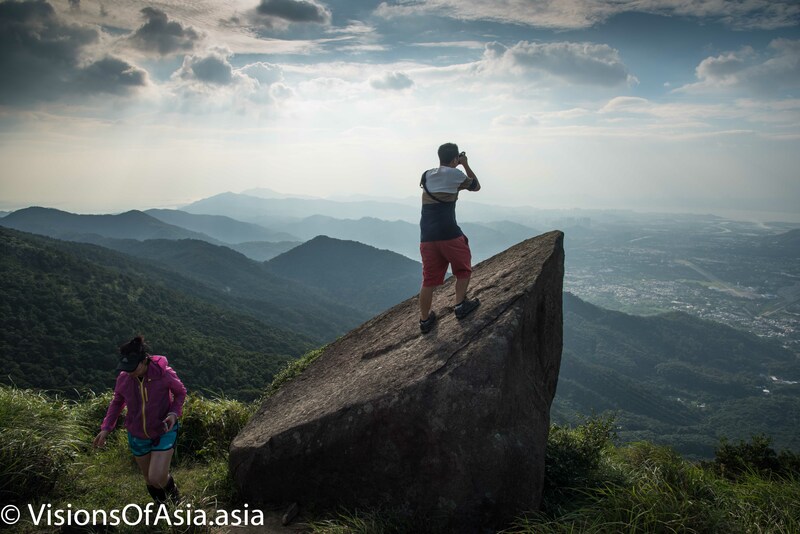 You can also climb up to the Finger Hill view point on stairs which are quite easy to hike upon. 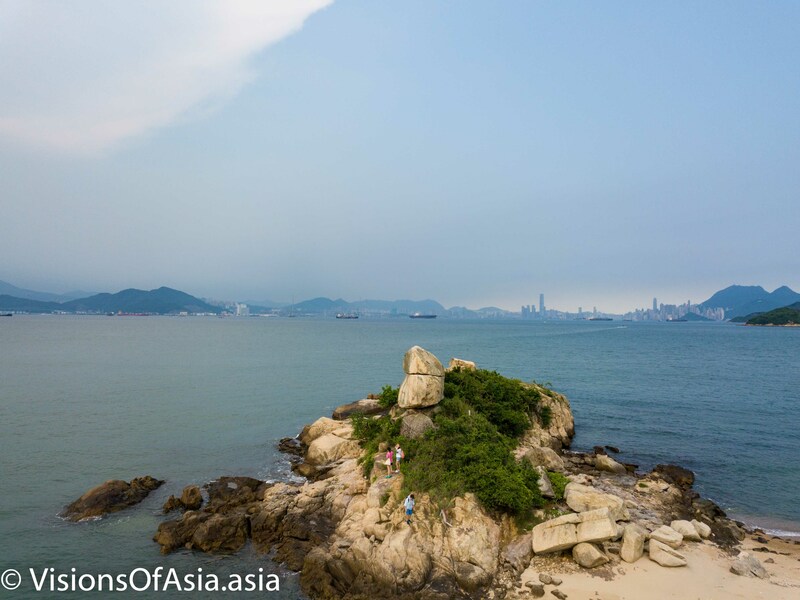 One of the landmarks of the island, at its northern end is the “old fisherman’s rock”, a balanced rock formation, a bit similar to the one found in Tap Mun island. The old fisherman’s rock in Peng Chau. This place is easily reached after 20 min-1/2 hour walk from the ferry pier. 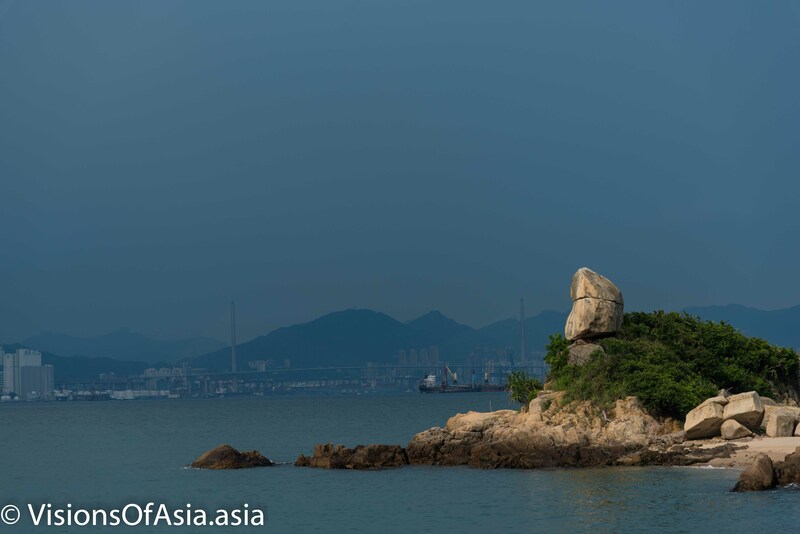 The interesting part of this rock is the view it affords on both, discovery bay (Disneyland) on the other side and the Tsing ma bridge in the distance. Nearby, there is an even more secluded beach, where I managed to stumble upon a scene directly taken out from the 1950’s… A young lady smoking a cigarette in the middle of the sea. 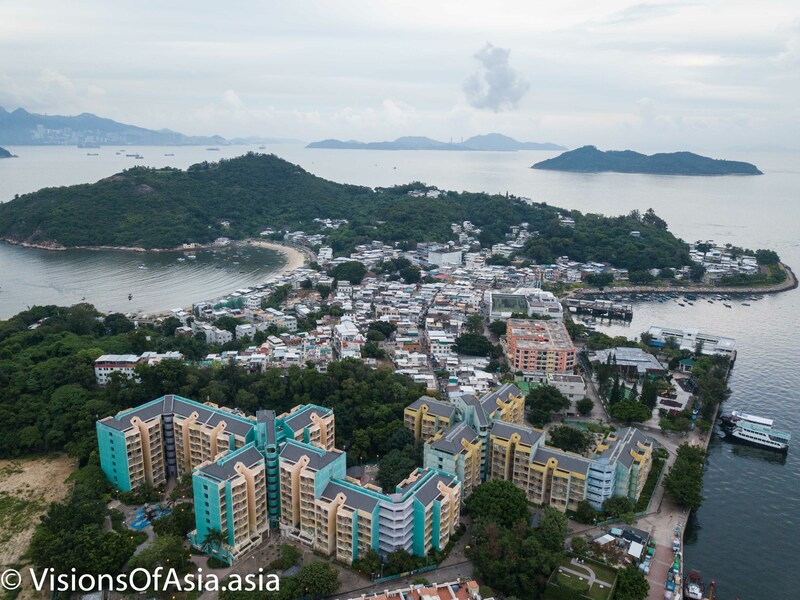 Cheung Chau is said to be small, but it seems that Peng Chau is quite smaller. This is best understood when looking at it from a drone. 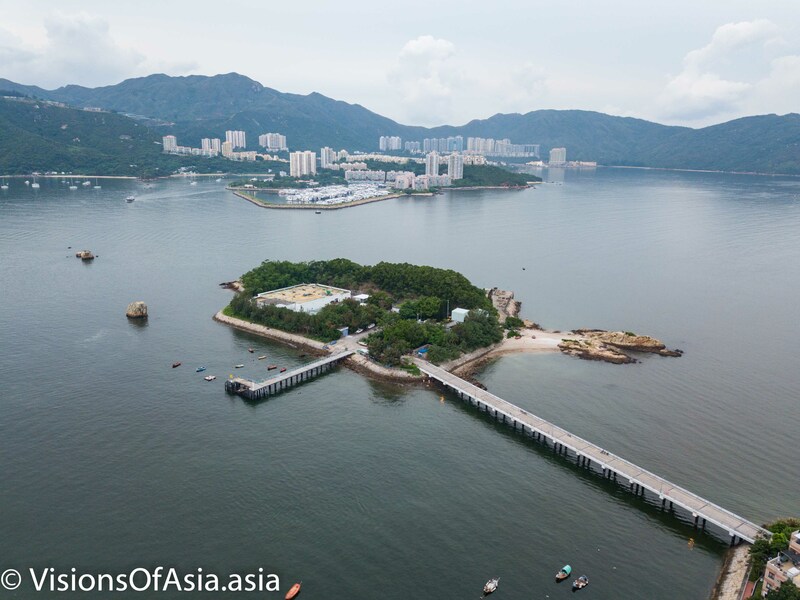 The main island is connected by a land bridge to a tiny island called “Tai Lei”, on which are hosted most of the utilities for the island. BTW, there are no cars at all on Peng Chau, which makes it absolutely lovely. On the opposite side of the Ferry pier, there is a, inviting beach inside a cove. One warning however: there is a large infestation of big cockroaches all over the beach’s wall. Seem they have a huge pest problem on the island, and by the behavior of the insects they are not very scared of humans. 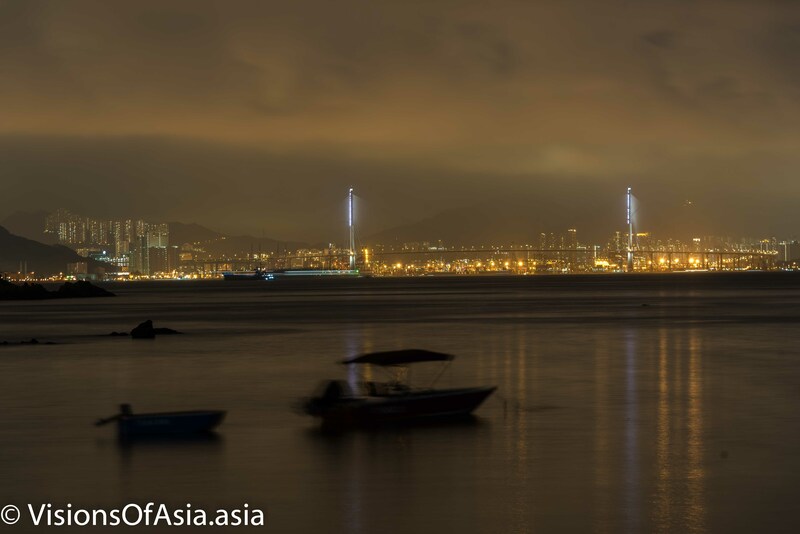 At night, that beach provides the ideal setting for some night photography with a magnificent view on the Tsing Ma bridge. The Tsing Ma bridge seen from the Peng Chau beach. Getting to the island is pretty easy. You must go to pier number 6 in Central, and from there catch one of the two hourly ferries. It takes roughly 40 mins to navigate until Peng Chau, but the island itself is covered in half a day, depending on your walking speed. There was not much to know about the Mavic 2 pro, or rather the “Mavic 2” as DJI has dubbed it. Nevertheless, this last piece of technology from DJI is already out and its specs can make you salivate. Obviously, if you just want to purchase it, or read the specs directly on Dji’s web site, then just click here. The Mavic 2 Pro has a Hasselblad camera and as expected with the size of 1″, the camera sports a whooping 20 MP to boot. Of course, as previously mentioned, this is bound to annoy all those who purchased a Phantom 4 Pro. The Mavic 2 will provide better technology in a more compact format. The new feature is the apparition of “HDR video”, which seems that they will apply the multiple exposure concept of HDR to video (how?). Comparatively, the Mavic 2 Zoom will remain stuck with the 12 MP camera, although it gains a capacity to create composite images corresponding to about 48 MP. As anyone who works with the Mavic Pro knows, the current Mavic Pro has a fixed aperture, which is very annoying in bright sunlight and seems to force the use of ND filters. Oh yeah, now they also have a downward facing light to enable landing in low light. While it seems the drone is very much geared towards dusk or sunset operations, it is worth remembering that in many countries, operating a drone after sunset is illegal. As anybody who uses sd cards knows, these may be quickly overloaded with some 4K videos. The Mavic 2 offers a temporary fix under the form of 8 GB of onboard storage. So, hyperlapse is a sort of timelapse, but shot while moving (instagrammers know about this). The point is that, until now, many Mavic Pilots used third-party apps such as Litchi to be able to program their Mavic along a preset route. Dji now integrates this function on the Mavic 2 Pro. What is the image quality? For sure, the images look a notch better than the habitually washed out tones of the Mavic Pro, but I couldn’t help but be disappointed. 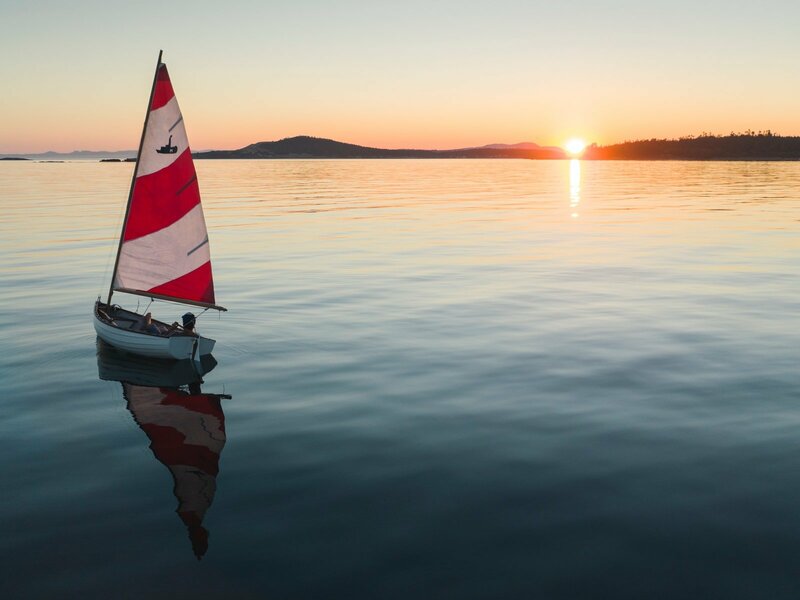 With all the post-production efforts put into promotional pictures, the samples Dji shows us on their web site show again a certain lack of dynamic range. In short, it is probably a significant jump from the Mavic Pro, but it is not yet at the level of offering the same depth of colors as even an older camera as the Nikon D750. For more details on other aspects of the drone, you may check Endgadget. While the bigger sensor and the Hasselblad camera are certainly winners, I am not sure the new drone is necessarily something to have, unless, obviously, you are making a profession out of piloting drones. In that latter case, obviously, the Mavic 2 Pro should be the ideal drone, compact, yet with a high and versatile camera. I won’t even say a word of the Zoom version, as the optical zoom, to me, is just a gadget that does not justify in any way purchasing a new drone (especially as the camera remains at its current 12 MP). So, if you want to buy it, I am sure you can enjoy it, as long as you keep flying safely. If you already have a drone, think hard and long about it and whether the expense is justified. Its retail price will be of $1449 for the Mavic 2 Pro and of $1249 for the Mavic Zoom (price being another argument to switch to the Mavic 2 Pro, or even grab a Mavic Pro if they are discounted). In a few hours, Dji is having its launch event for the Mavic Pro 2. In the meantime, their decidedly leaky marketing strategy seems to have seriously deflated the expectations with regards to the event. DJI was not discouraged and started sending out yesterday a sort of video teaser for the persons who are registered in their database. To be honest, the teaser tells or shows nothing at all except some gorgeous imagery. The Mavic Pro 2 has definitely been heckled by the leaks of media campaigns released before the initial announcement foreseen in July 2018 was cancelled. Once again, a publicity was released in Germany, according to the website Dronedj. This came under the form of two zip files containing high-resolution pictures of the two Mavic Pro 2. The original tweet with the pics of the Mavic Pro 2. This means, as previous alluded, that the camera and sensor should definitely have much more dynamic range. The Mavic Zoom, instead will just offer a 2x zoom, with a smaller 1/2.3-inch CMOS sensor. Then again, another leak yesterday appeared to provide the full technical specs of the Mavic Pro 2. Given that this leak puts the camera on the Mavic Pro 2 at a maximum iso of 6400, it is fair to imagine that the imaging quality will be great at night (oh yeah, in most countries you are NOT allowed to fly at night!). Well, we mentioned earlier about the omni-directional sensors, so that may save more than one pilot from crashing his drone. Seems the range and stability of signal will also be addressed. One of the issues with the Mavic Pro is that you often get signal lost warnings when the drone is at some distance (especially if you are hidden behind something, like trees which interfere with the signal). The Mavic Pro 2 will standardize the low-noise propellers first introduced with the Mavic Pro Platinum. I had already adopted those propellers for my own Mavic as they provide lower noise and better energy efficiency. Some of the photos leaked seemed to suggest that the Hasselblad camera might be detached to be used as a gimbal. How would that work with the Dji Osmo Mobile 2 already launched, is a good question. Ok, admittedly consumers needing a gimbal won’t always own a drone. There is also talk of a Mavic Pro enterprise more geared towards professional application, such as rescue services, but specifications are still not so clear about that model. It is obvious that the sweet spot for photographers is with the Mavic Pro 2 thanks to its larger dynamic range and color quality. What is yet unknown is the numbers of Megapixel in the camera, but it should be a fair bet that it would be close to the 20 MP of the Phantom 4 Pro. Anyway, it is just a few hours away from the announcement, so stay tuned for the latest news when we get all the details about the latest Dji drone. If you are thinking of buying a drone, you may get one from the affiliated link on this web site, and if you already own one, Dji made an interesting article for newbie pilots. Proudly powered by WordPress Theme: Fotogenic.